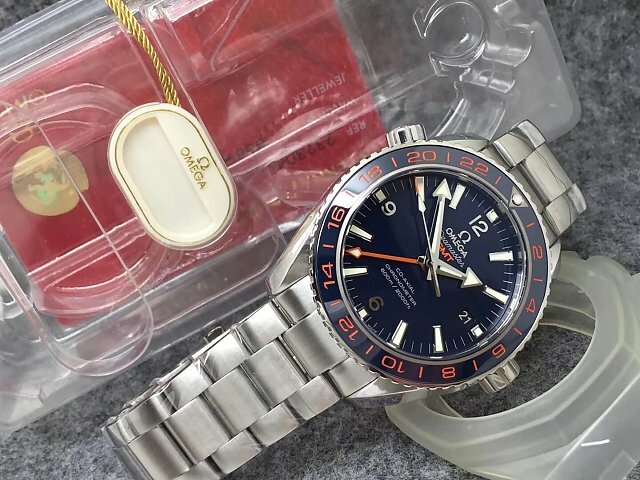 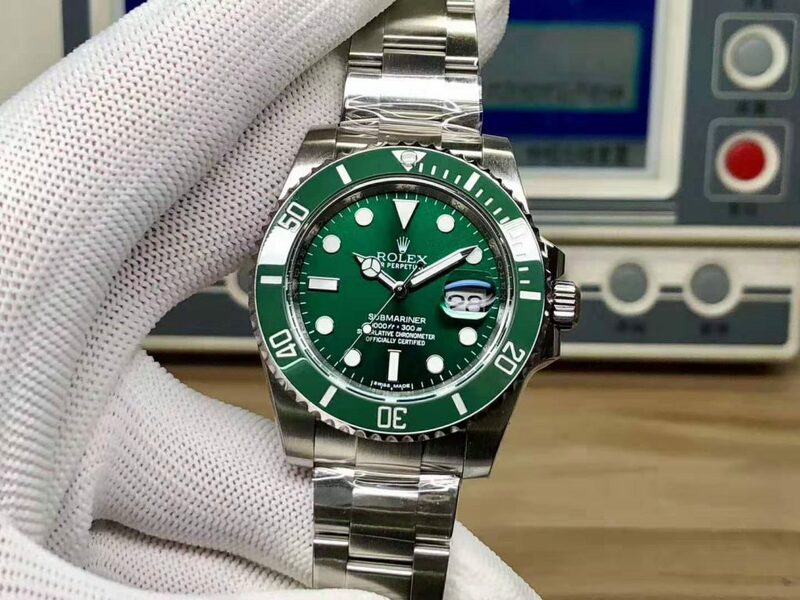 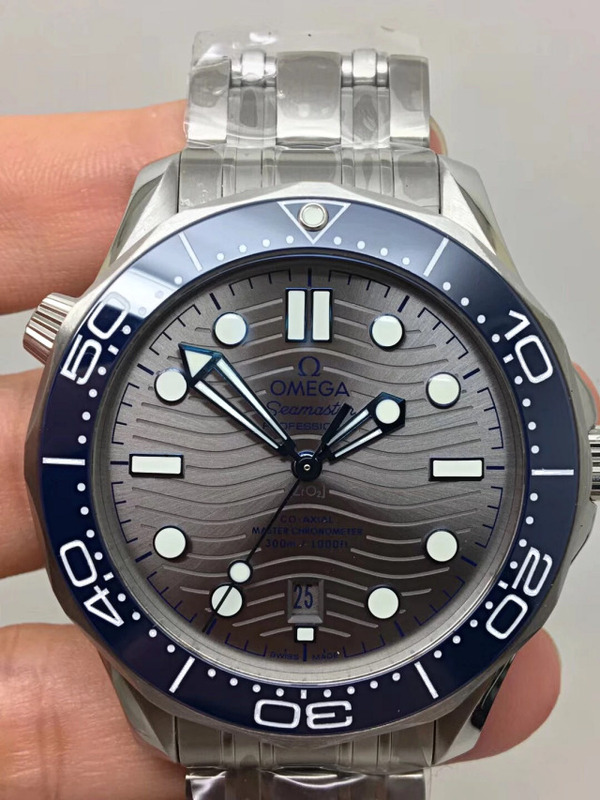 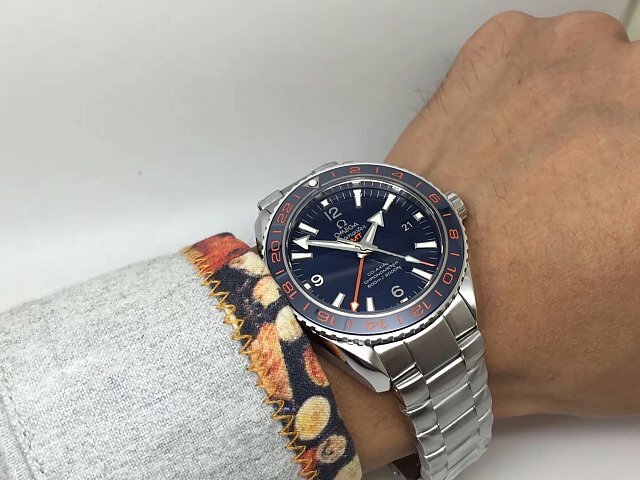 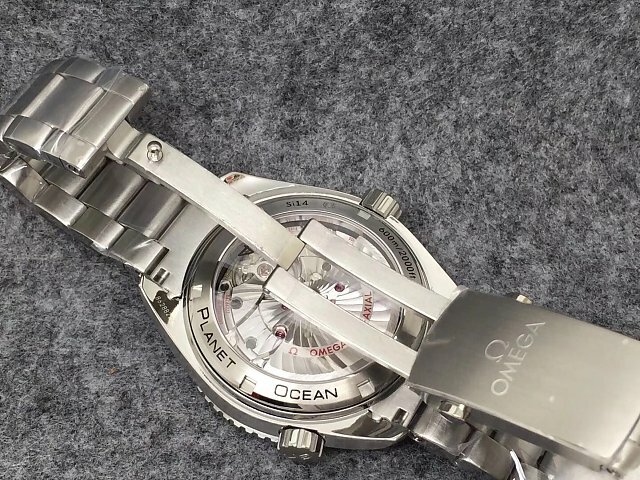 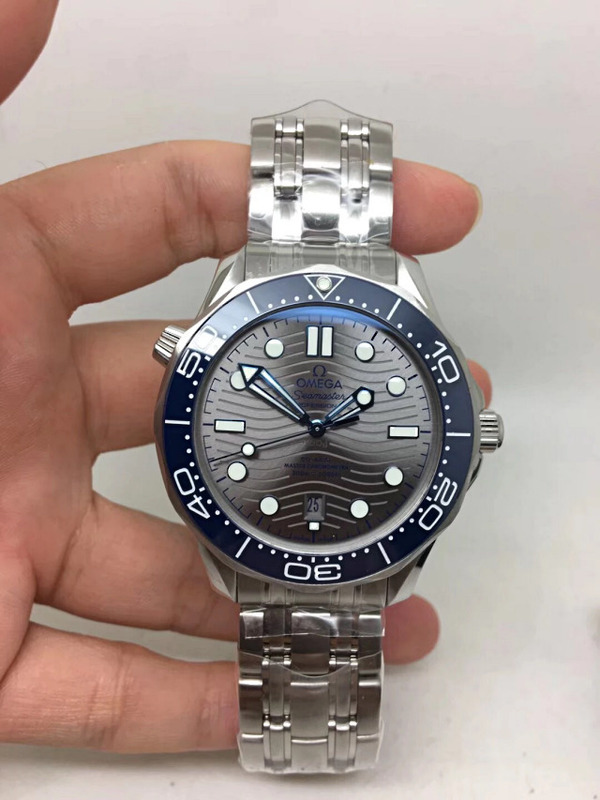 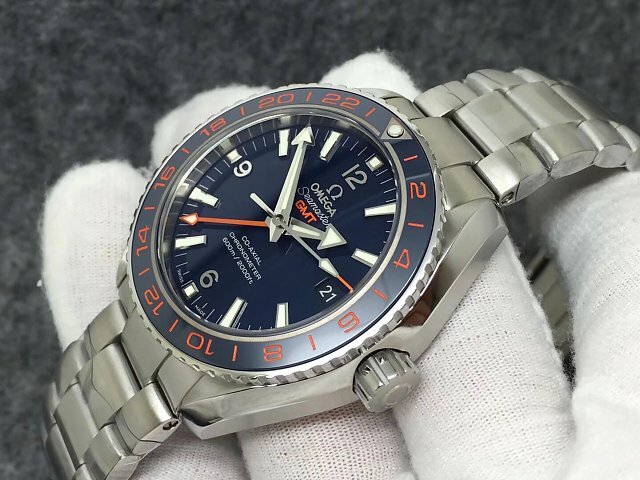 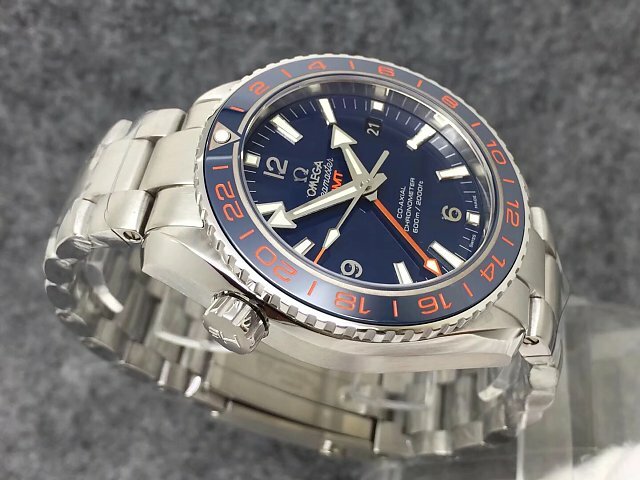 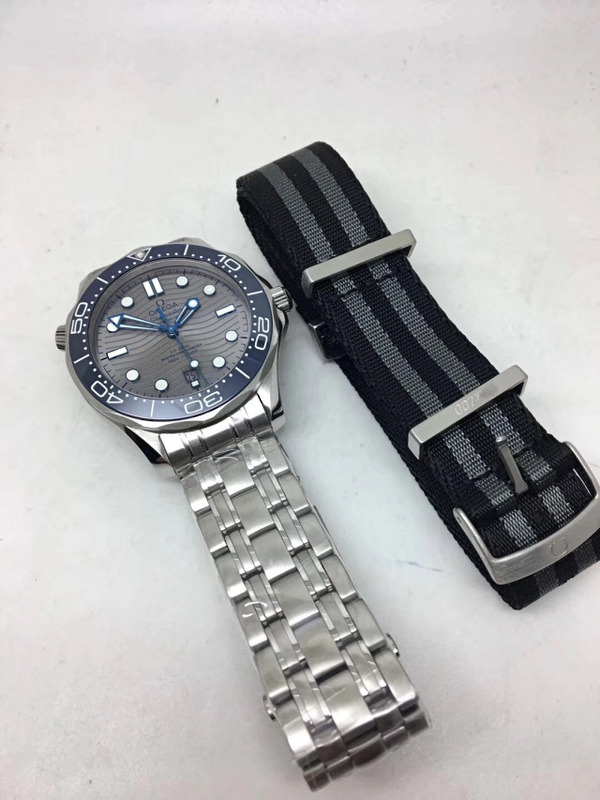 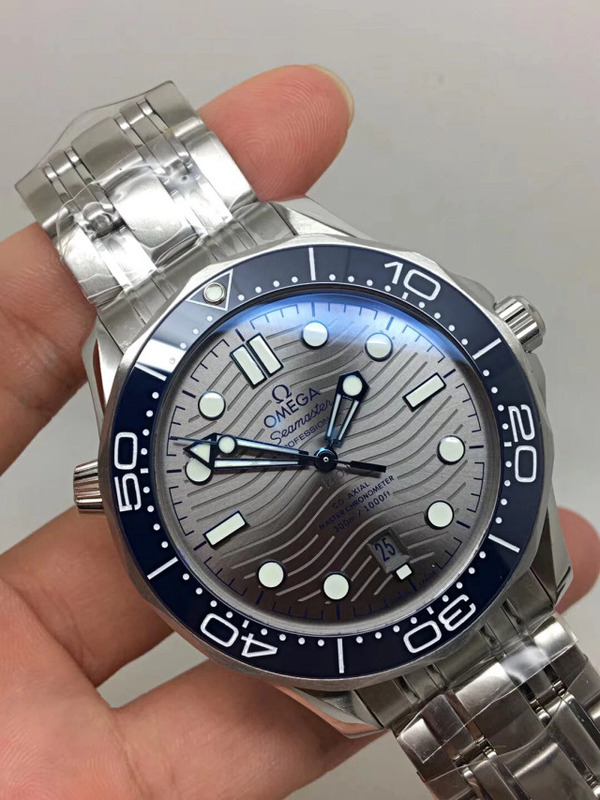 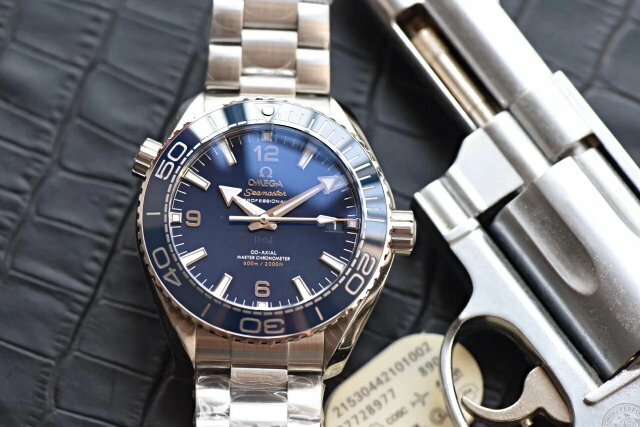 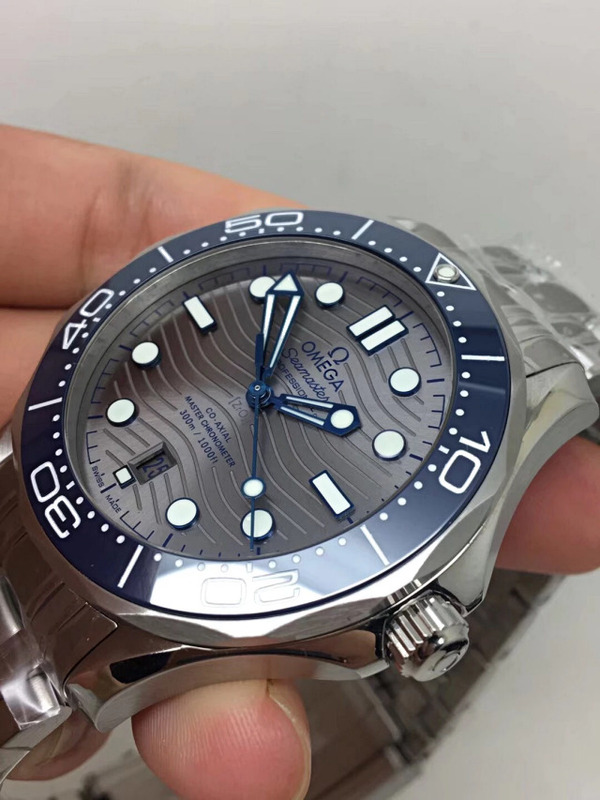 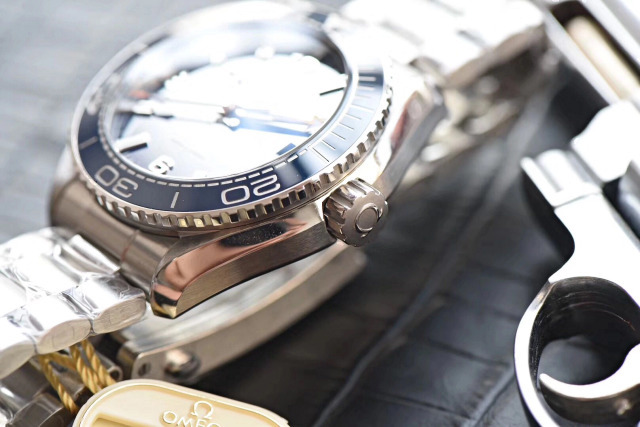 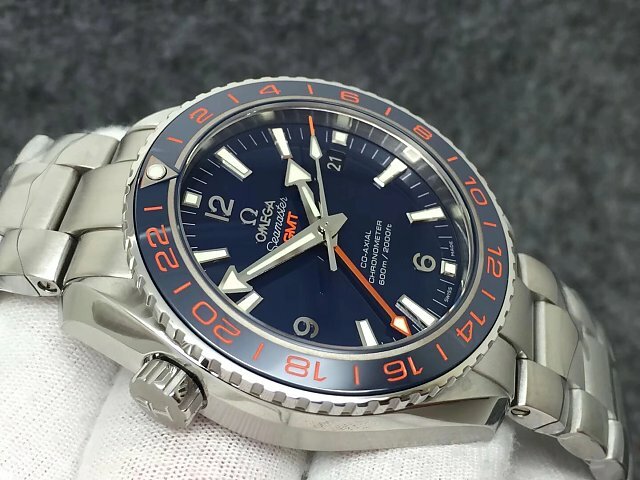 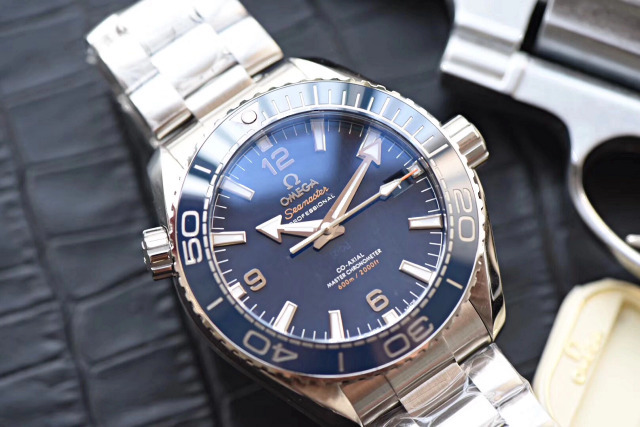 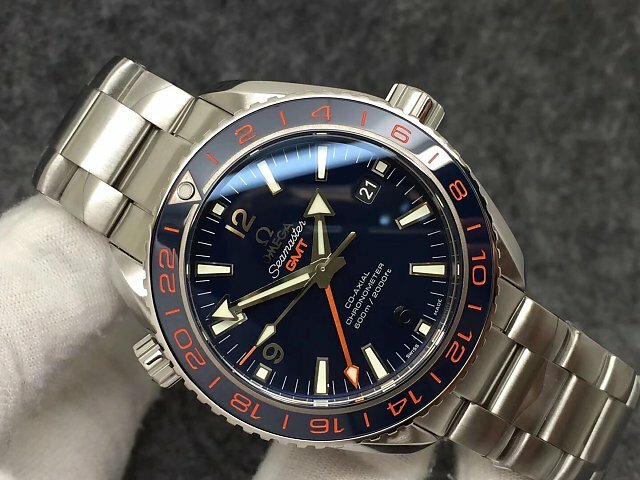 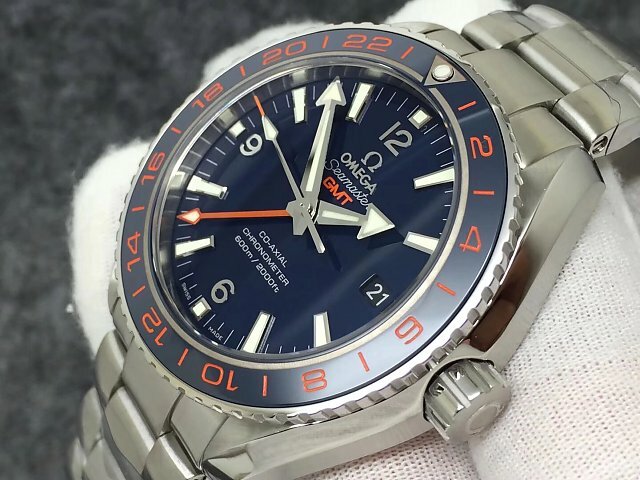 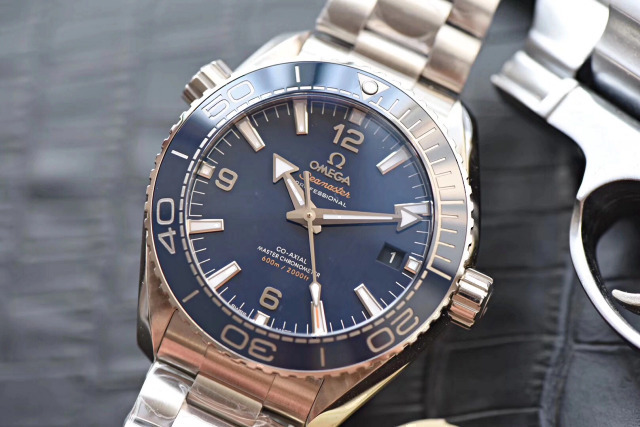 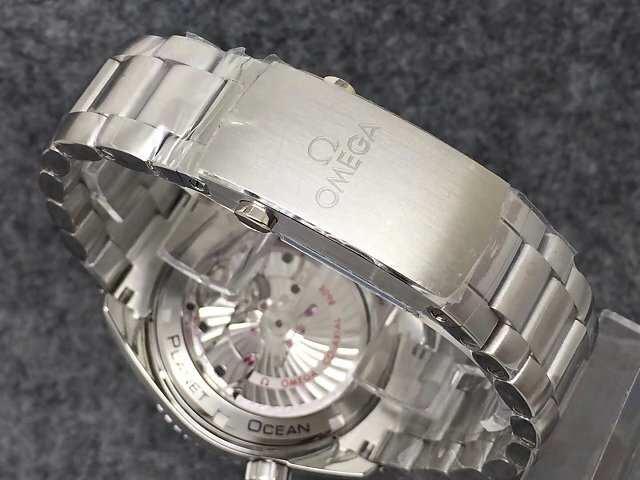 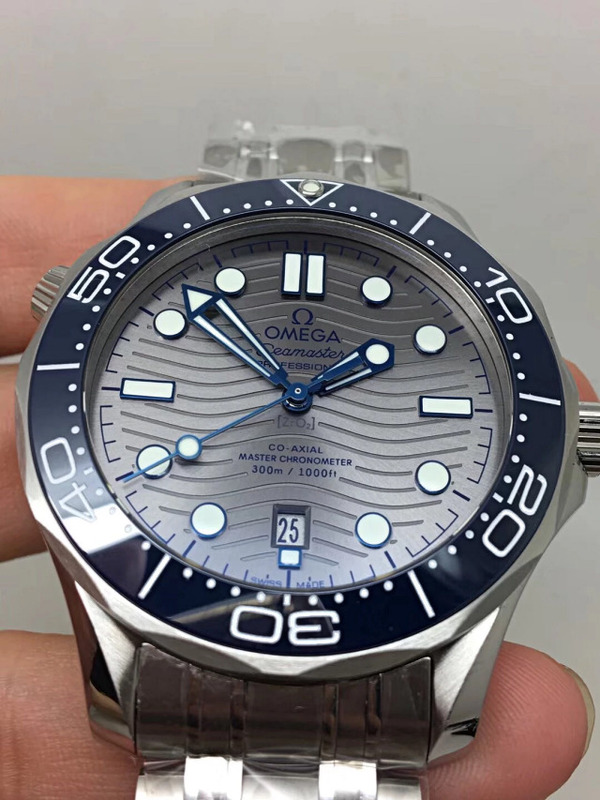 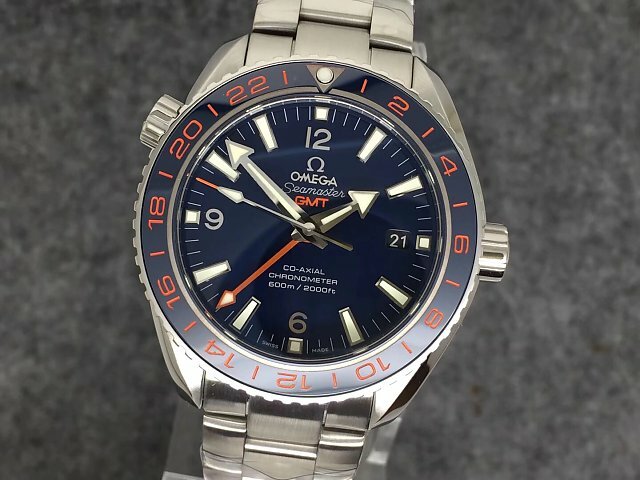 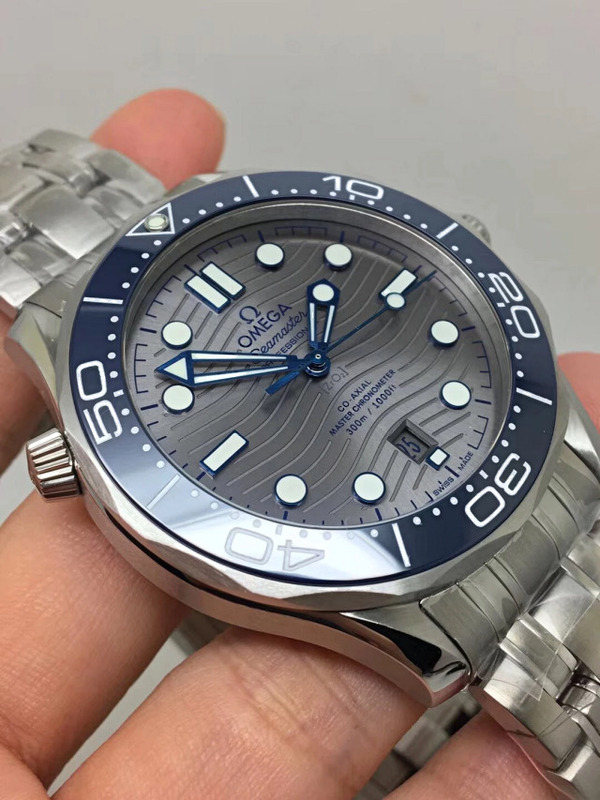 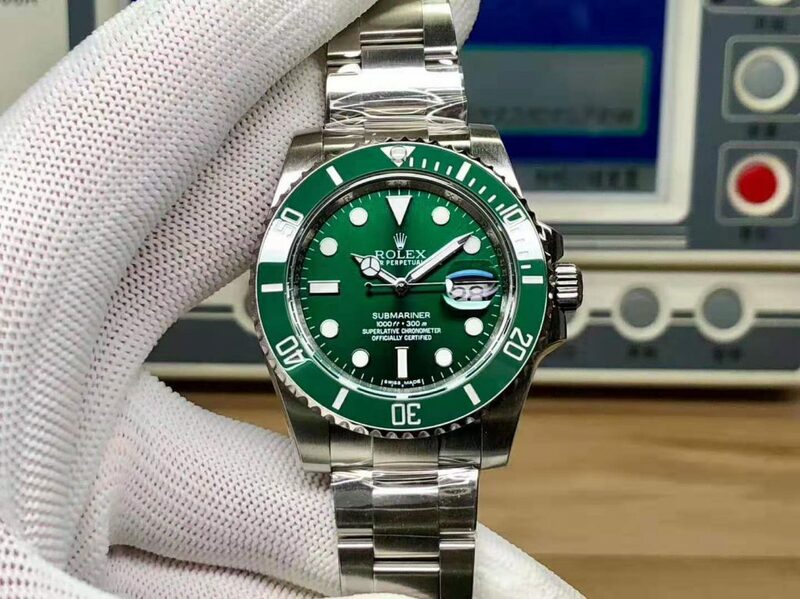 Throughout the October, VS factory published a lot of amazing replica watches, most of them are Omega Planet Ocean models. 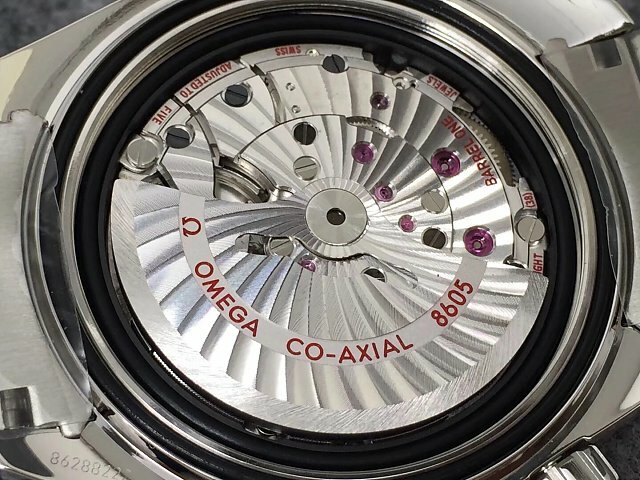 VS loves to make Omega replica watches because this factory has mastered the most mature technology in cloning Omega 8XXX series Caliber. 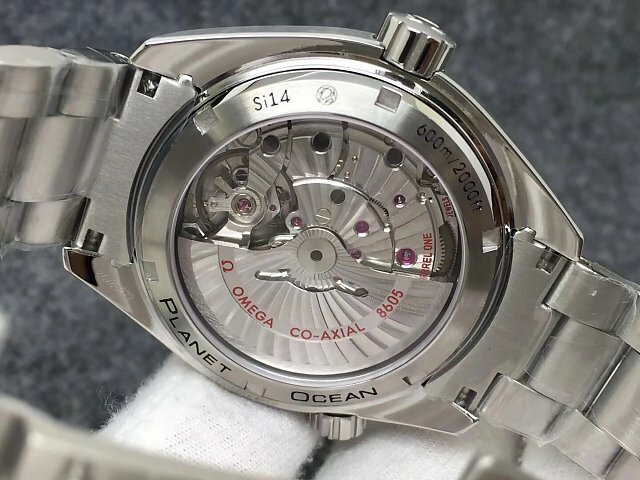 I like the Omega Spectre replica watch they made in 2016, after being improved for two times, the replica watch was sold out again. 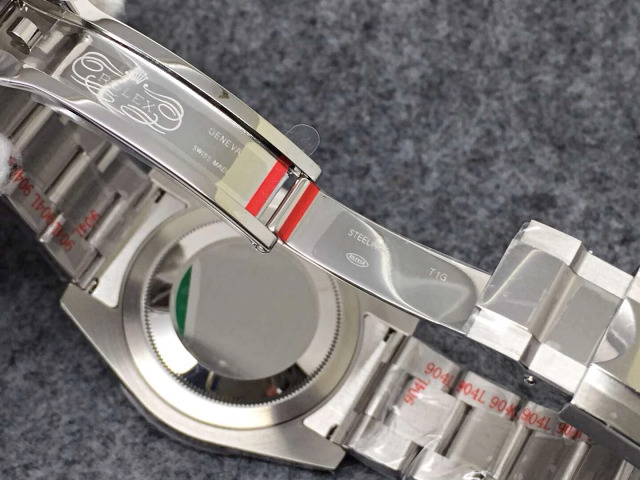 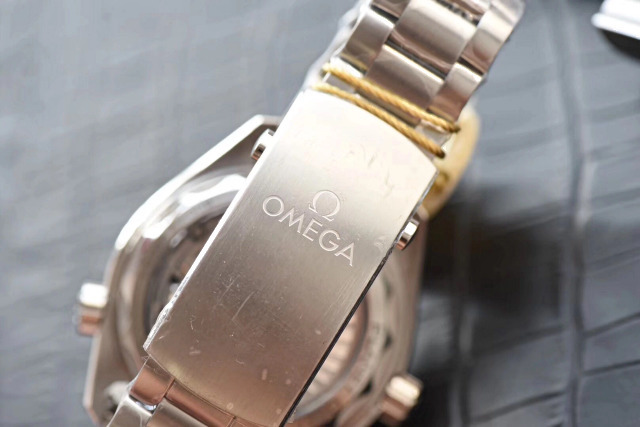 Now you can see how popular the replica Omega watch is made by VS factory, just like the Rolex replicas made by Noob. 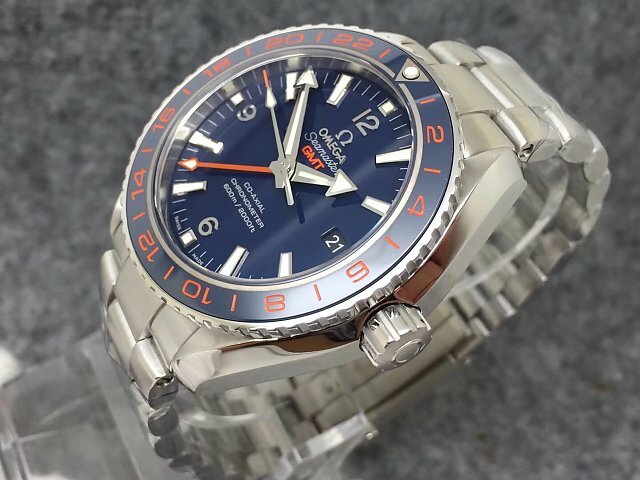 Today, I want to introduce a replica Omega Planet Ocean GMT watch, it is popular for the eye-catching orange color on the watch. 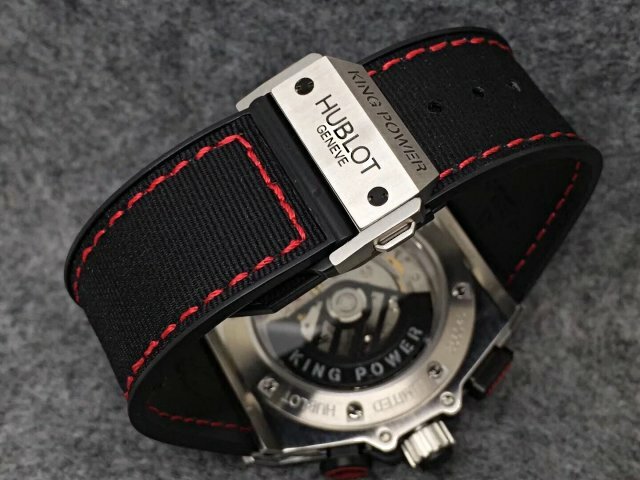 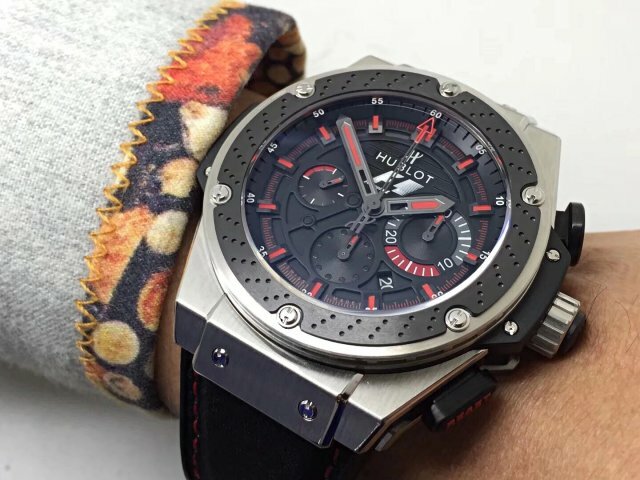 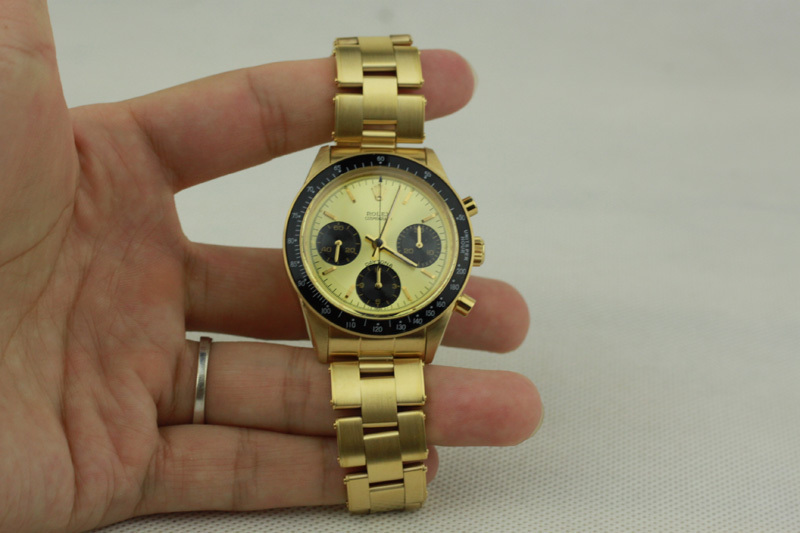 The replica watch has the same case size as genuine, it is 43.5mm in diameter and 17mm thick. 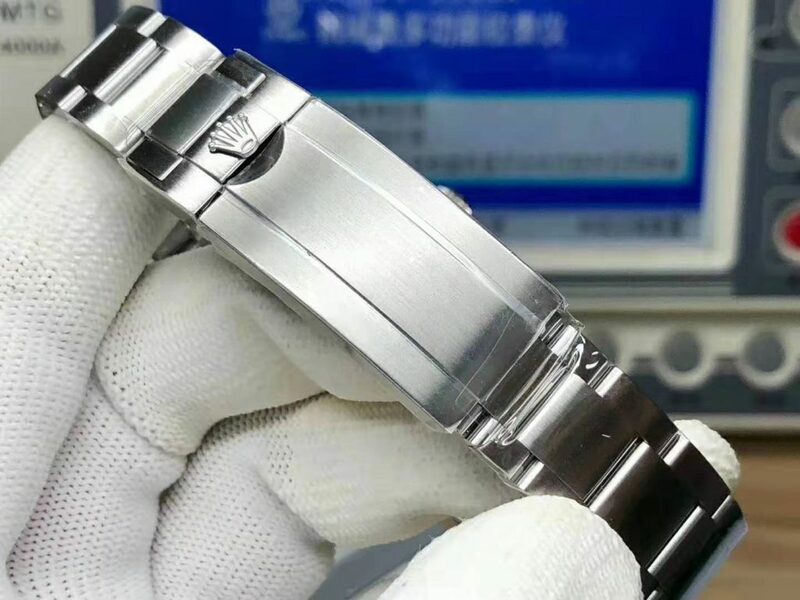 The case is made of 316L stainless steel and brushed on the face. 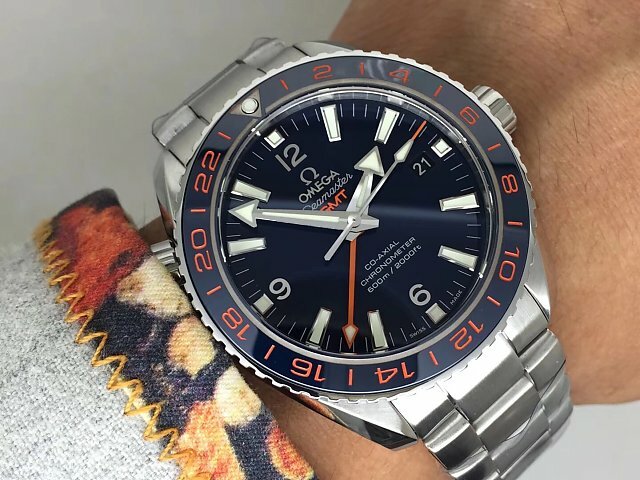 Blue bezel features 24-hour markers in orange, engraved on the blue ceramic bezel. 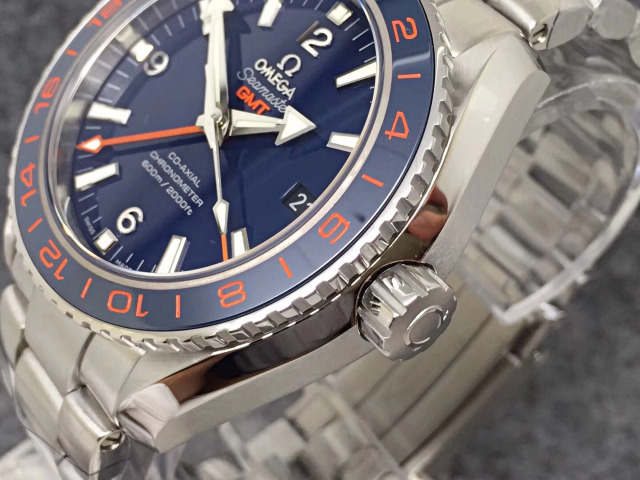 The orange GMT markers in blue background is very eye-catching. 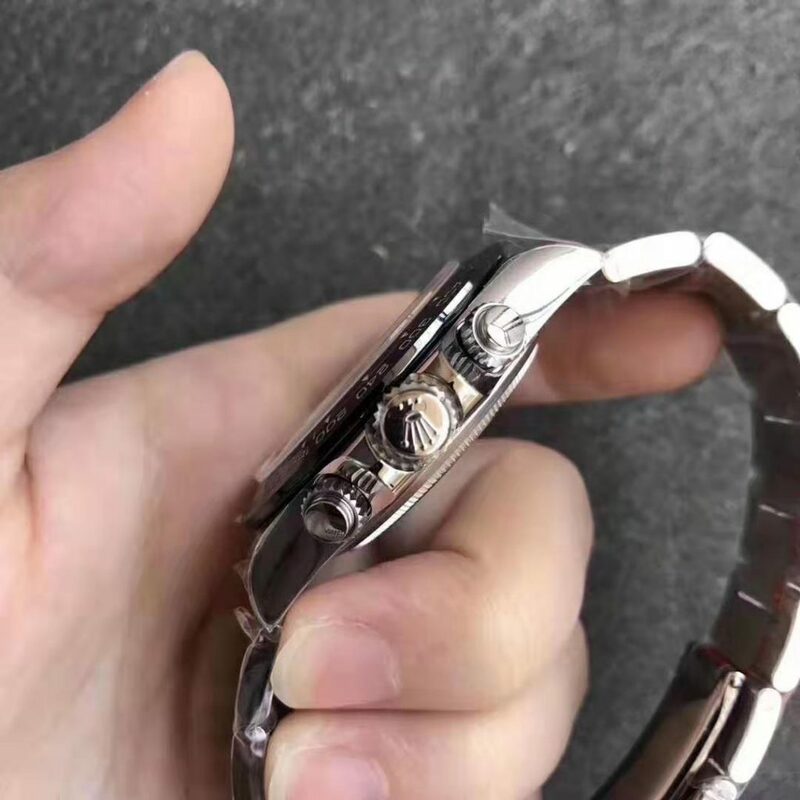 Bezel pearl at 12 o’clock is filled with luminous material and will emit green light in dark place. 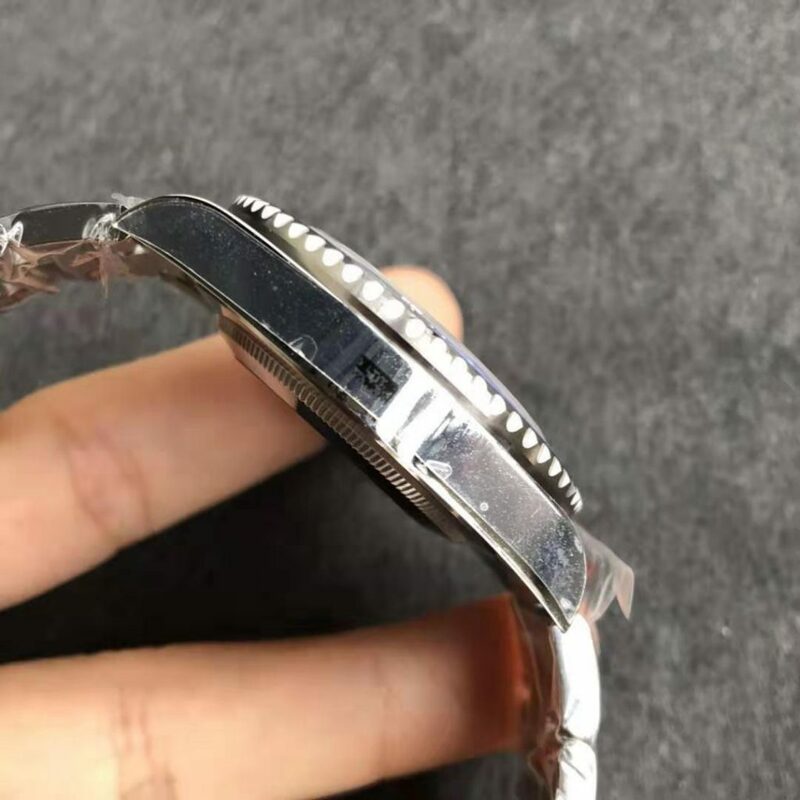 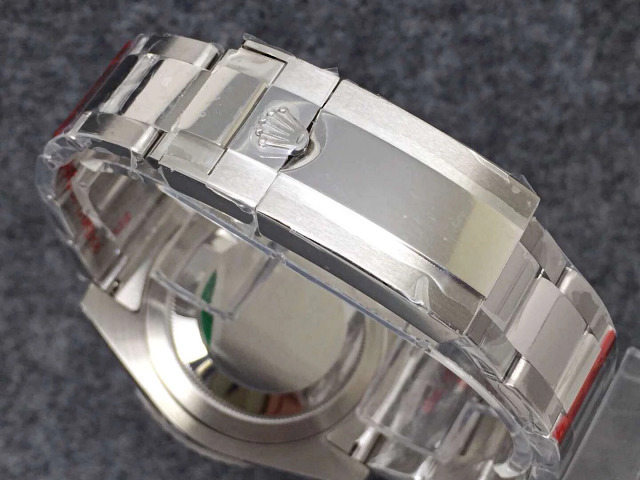 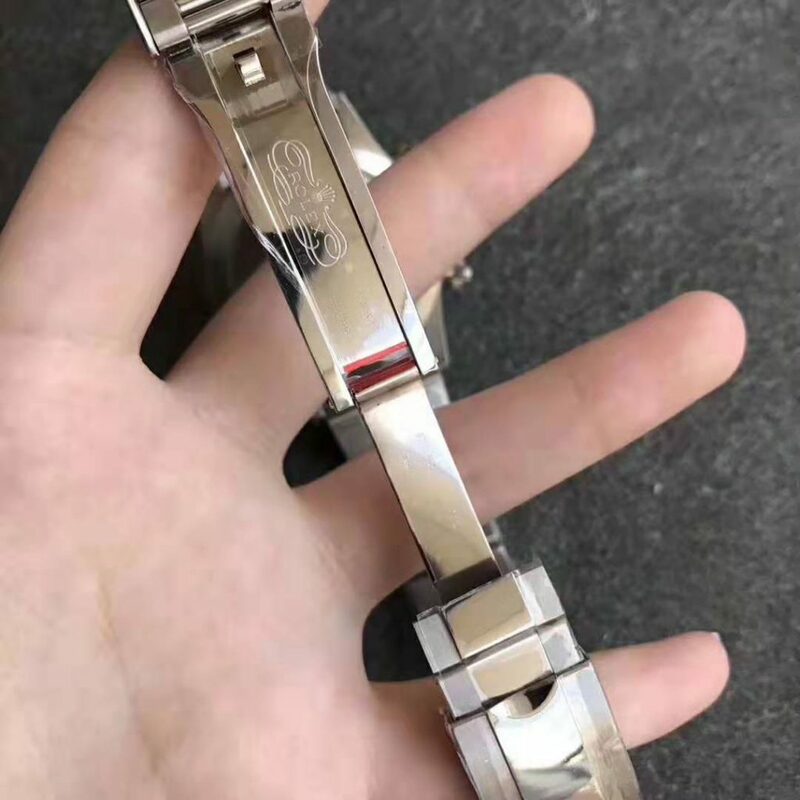 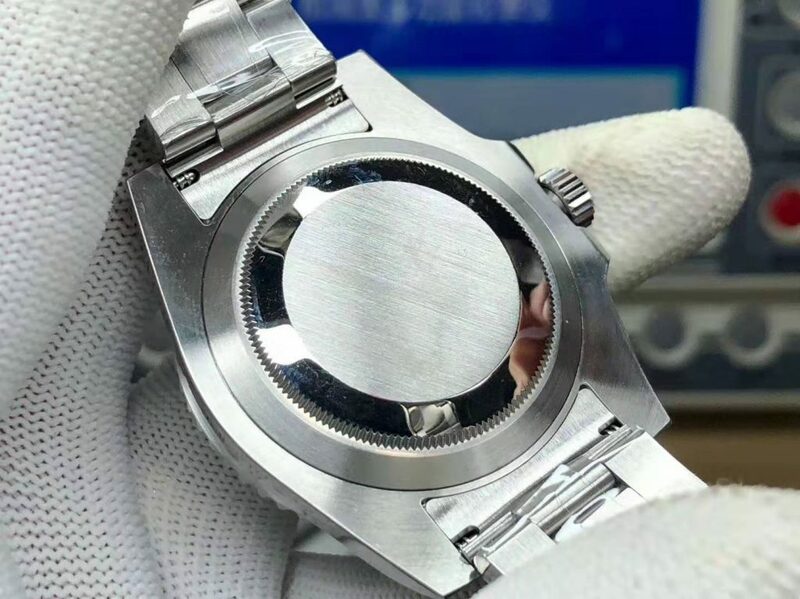 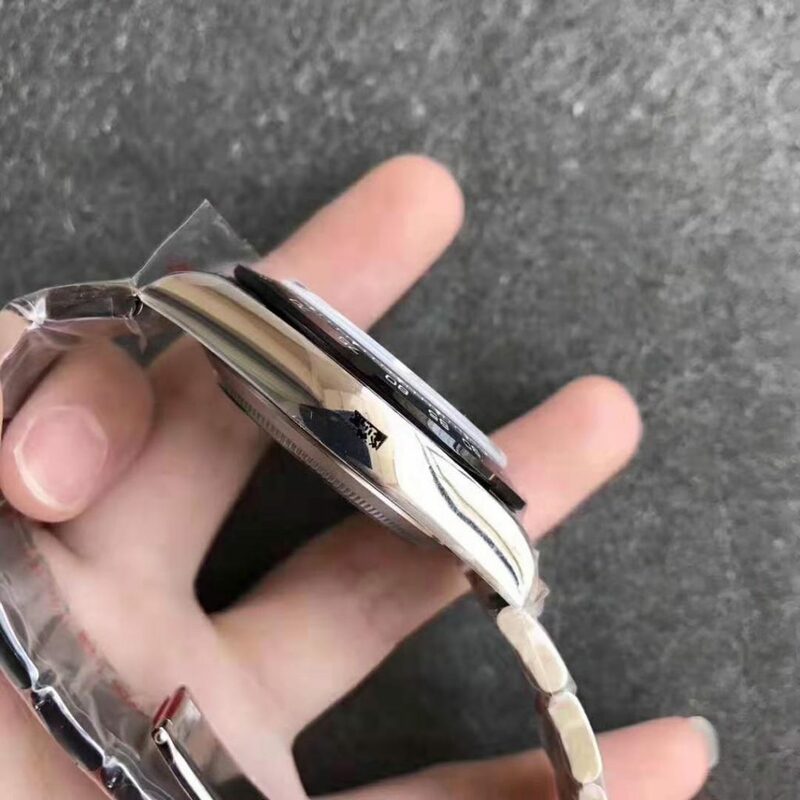 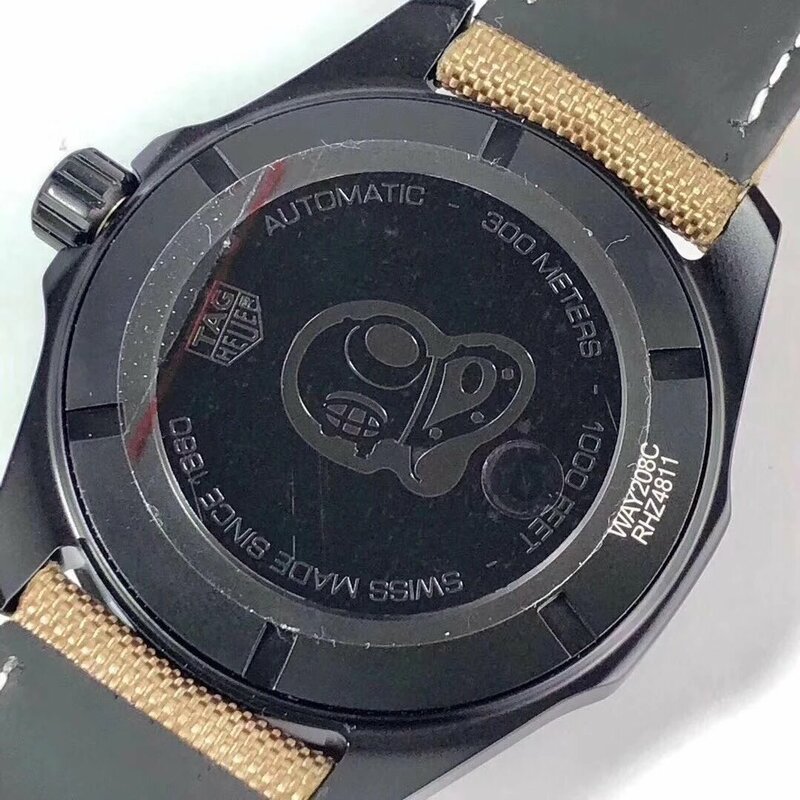 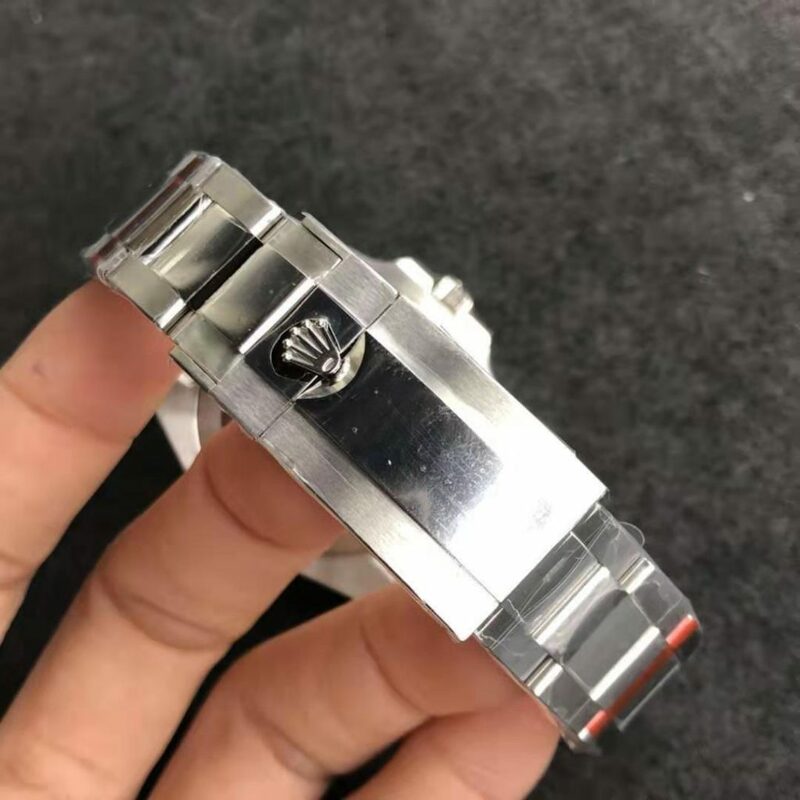 VS also does a perfect polishing work on the case, look at the Omega logo on the crown, it is not just a relief, it is more like an artwork, polished Ω logo in satin-finished crown face, such exquisite craftmanship in subtle details rapidly improves the quality of the entire watch. 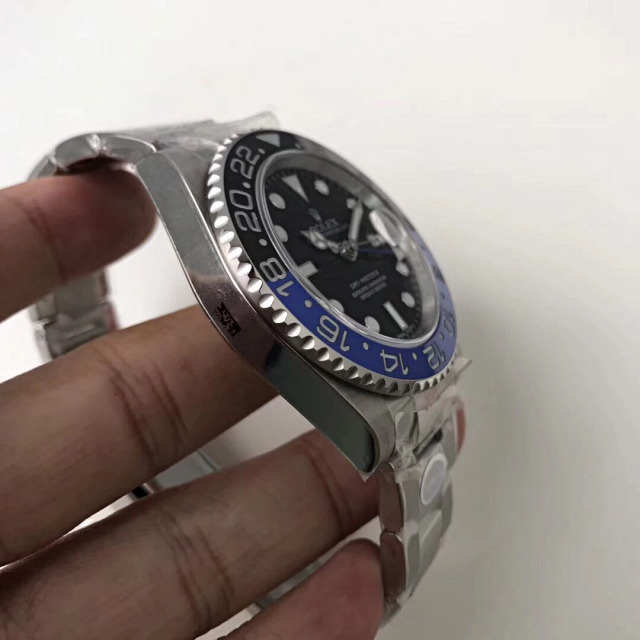 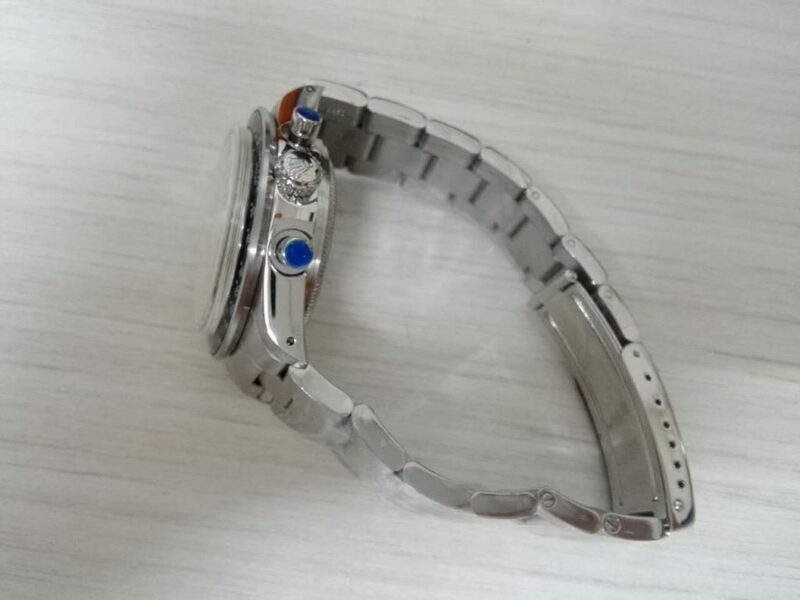 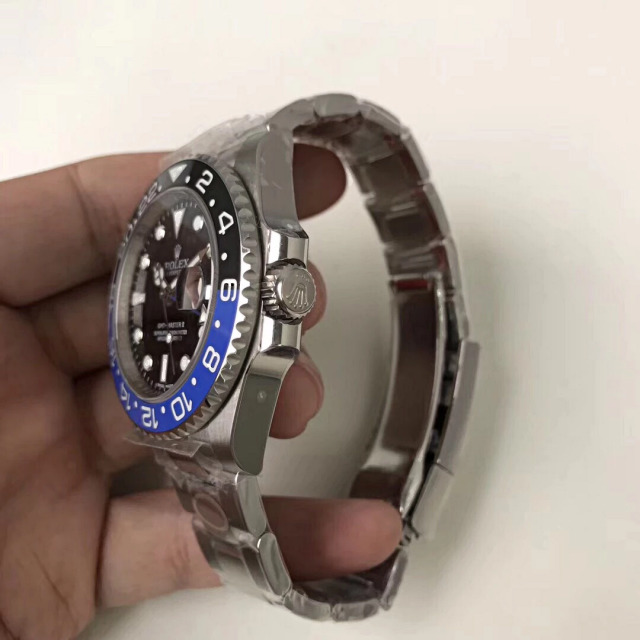 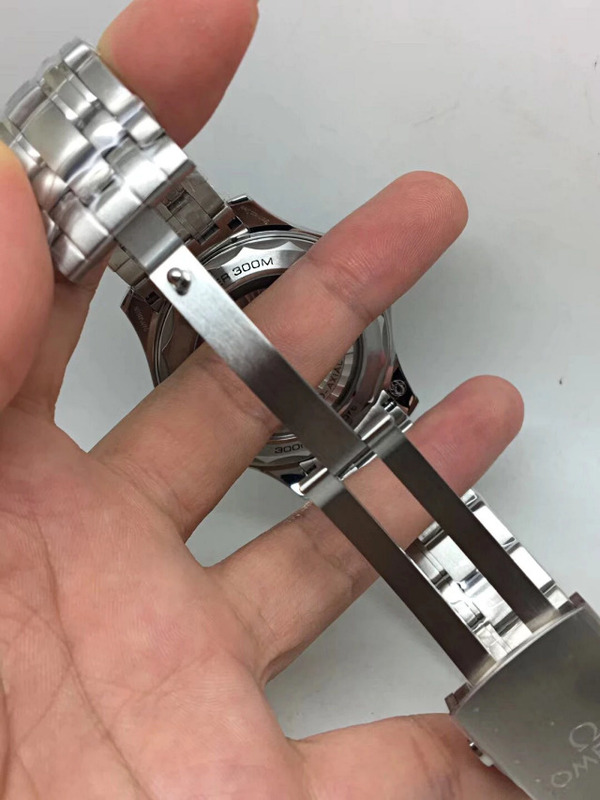 From transparent sapphire crystal case back, you can clearly see the movement, which is an Asian clone 8605. 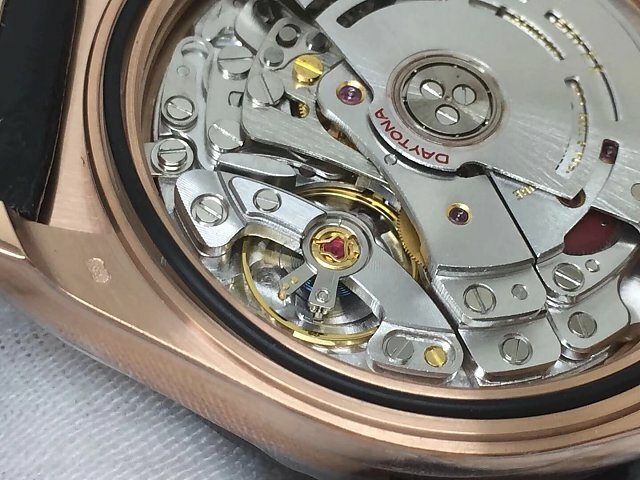 The movement offers hours, minutes, seconds, date and gmt functions for this replica. 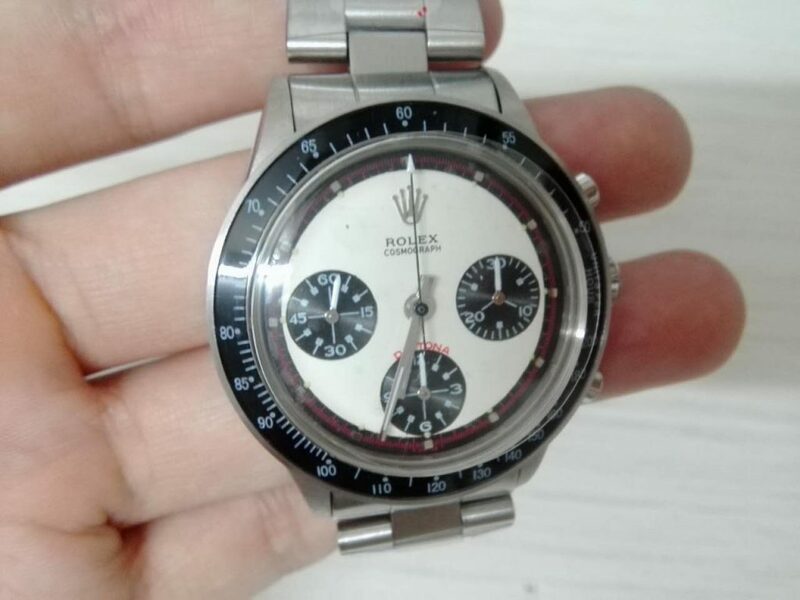 All genuine features could be found on the replica. 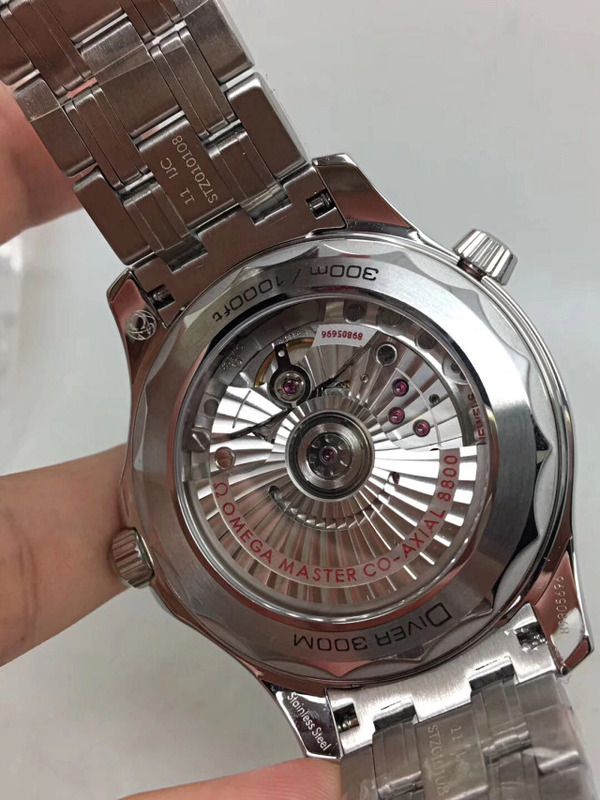 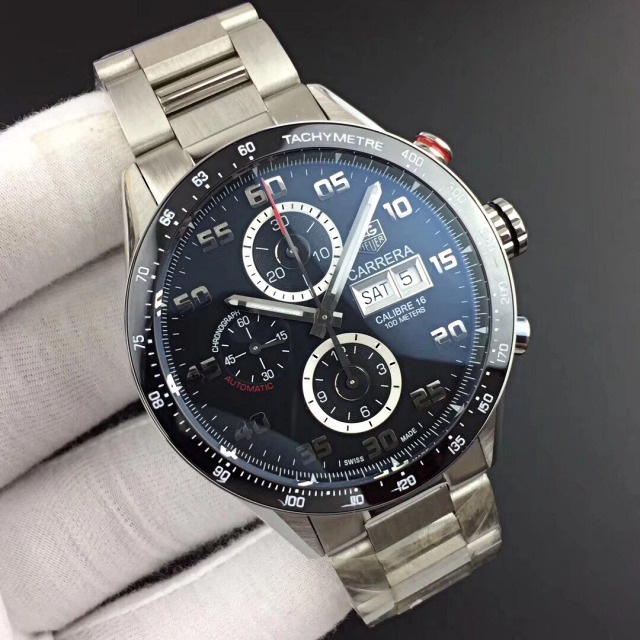 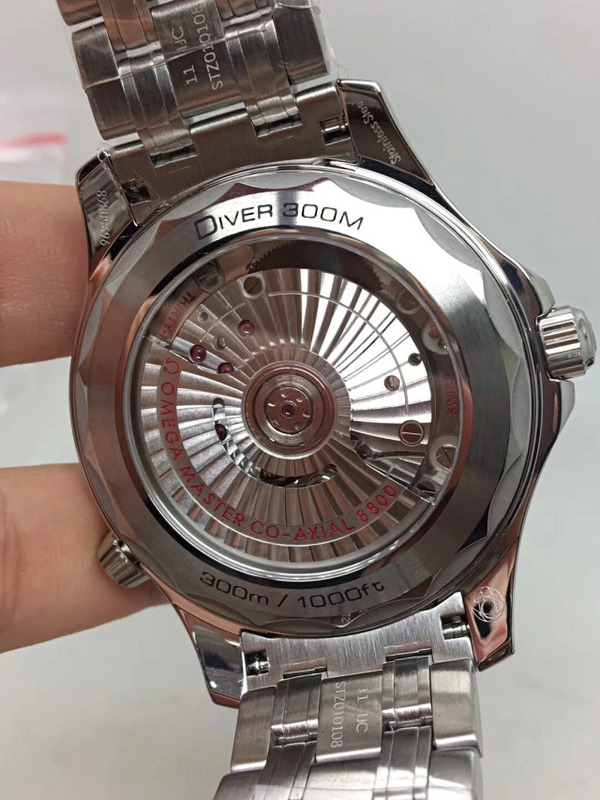 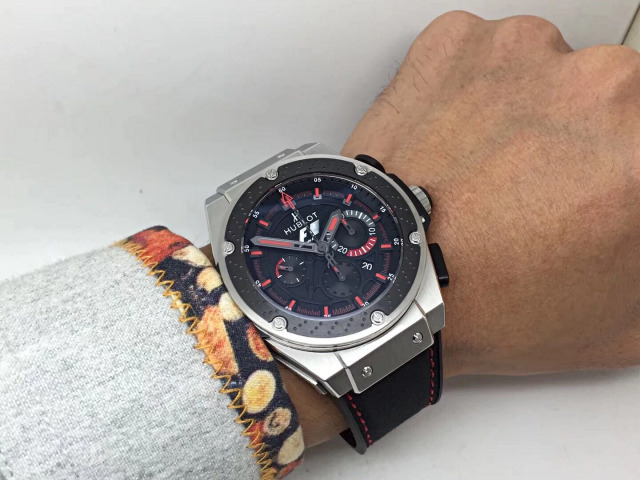 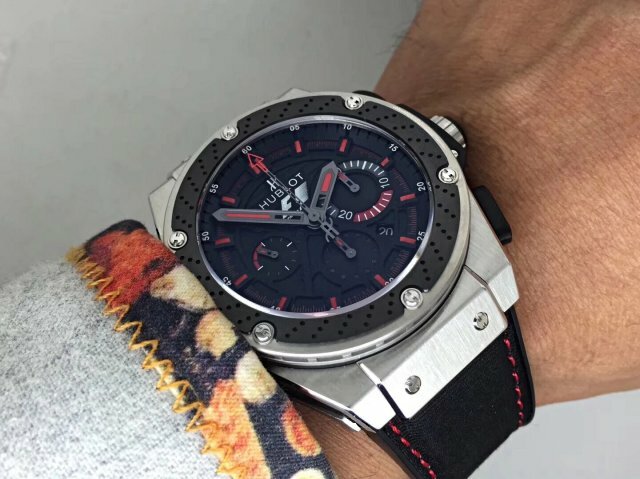 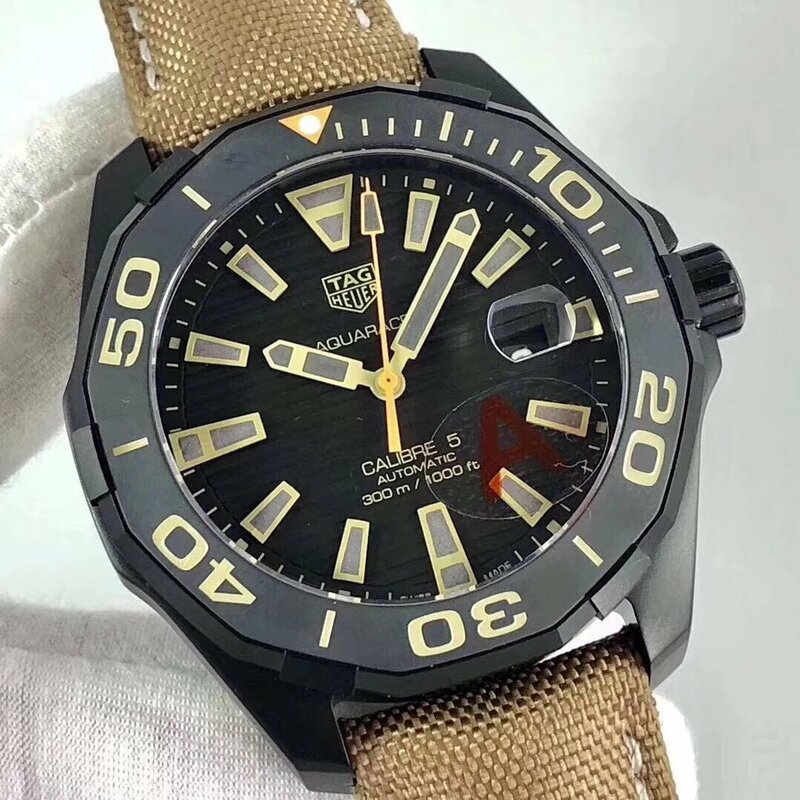 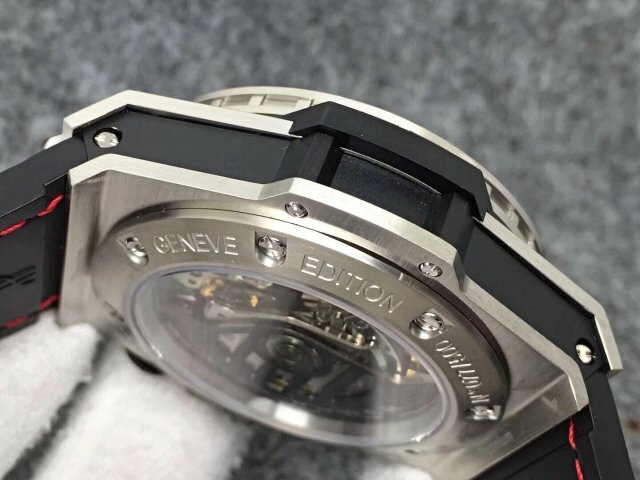 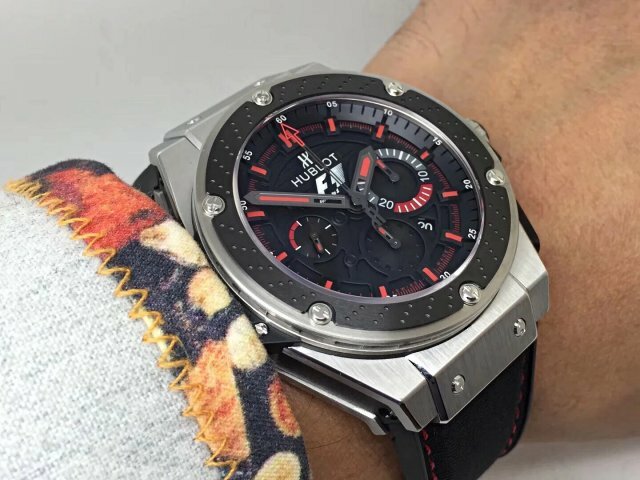 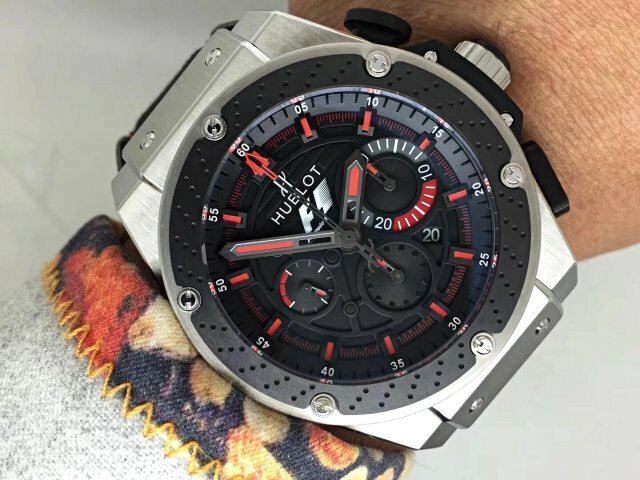 The Asian clone 8605 has a high quality finish, auto rotor and movement plates feature beveled patterns, balance wheel is blackened, there are also black and silver screws fixed on the plates. 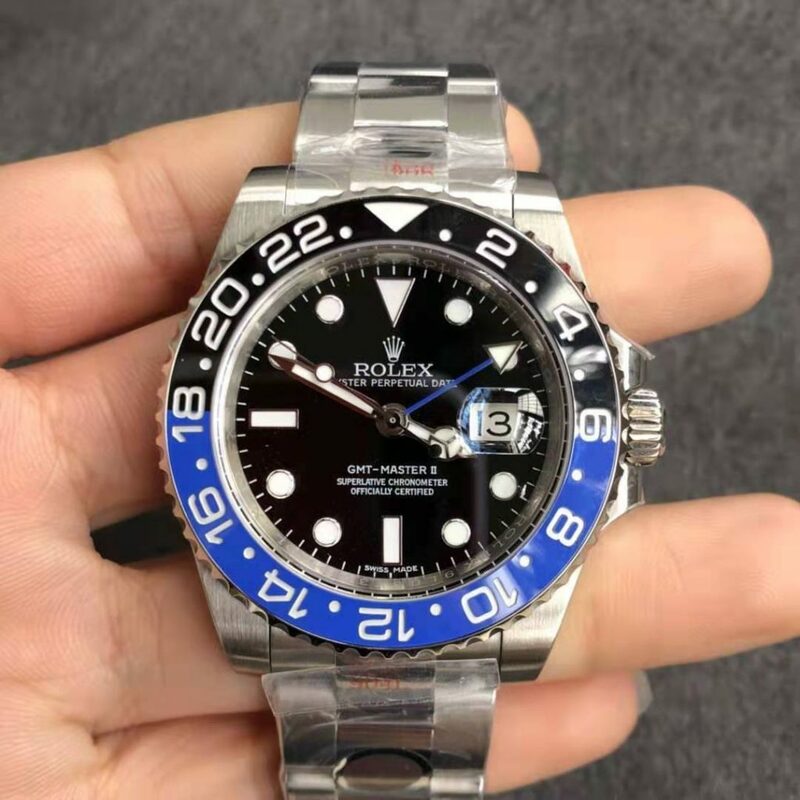 Dial is blue, which is in line with the blue ceramic bezel. 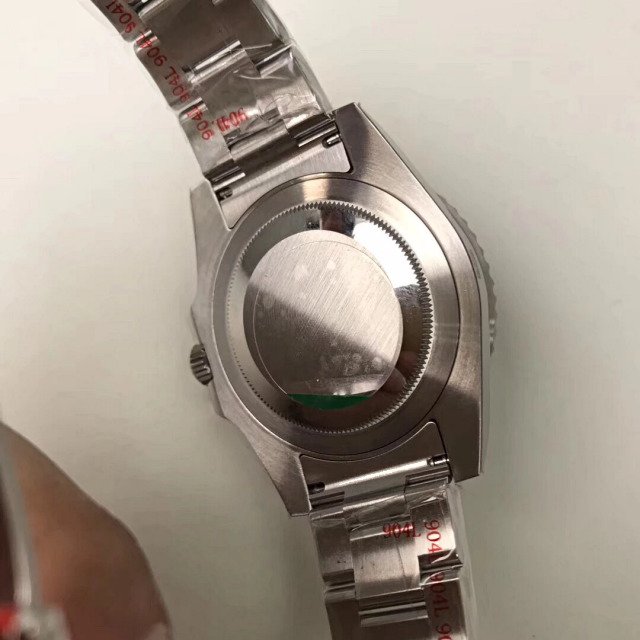 Bar-shaped silver hour markers are filled with white luminous material. 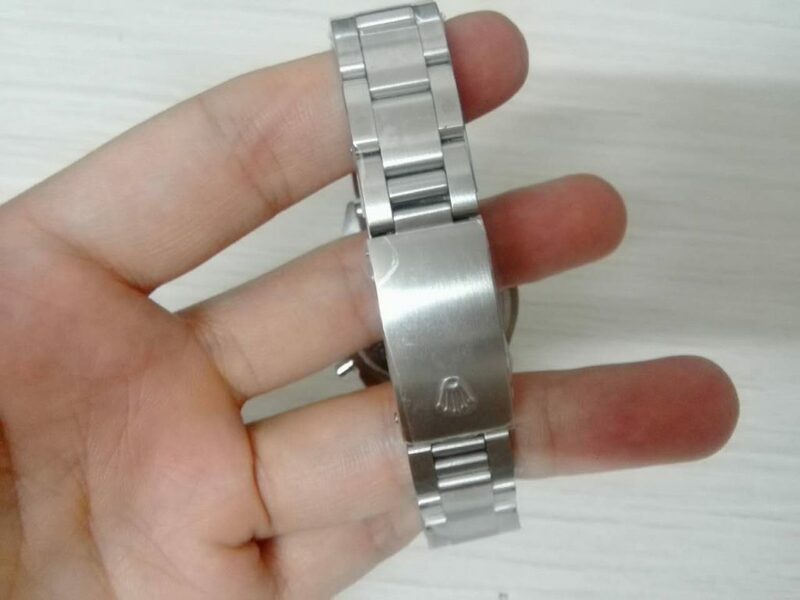 Central orange hand with a triangle mark is pointing at the time in second time zone. 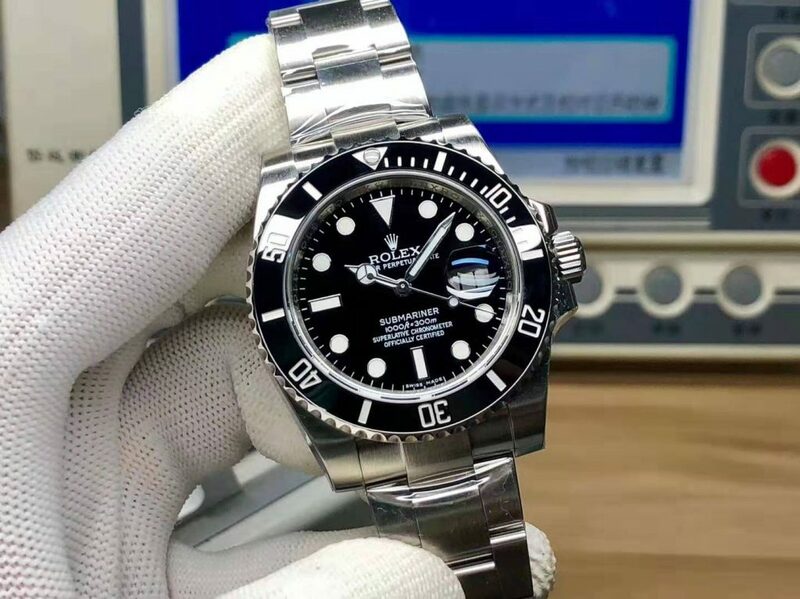 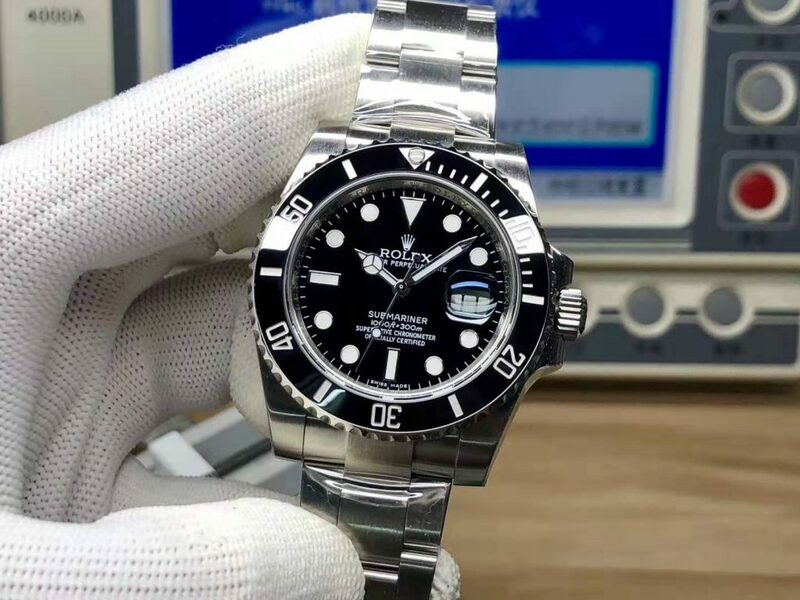 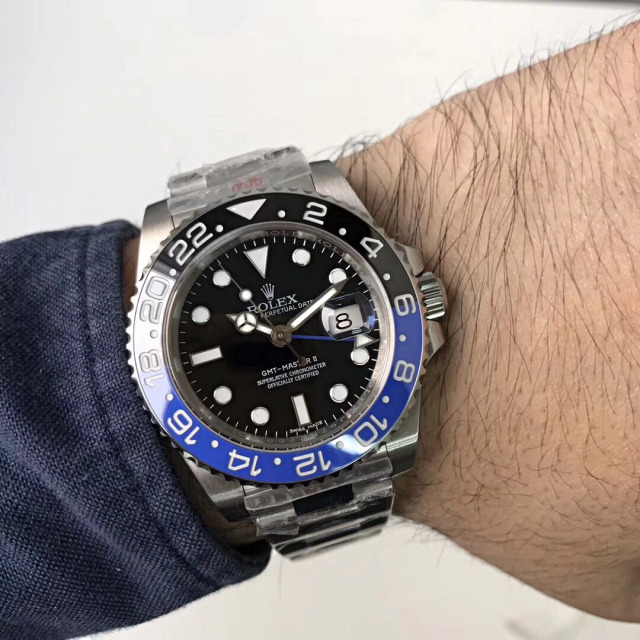 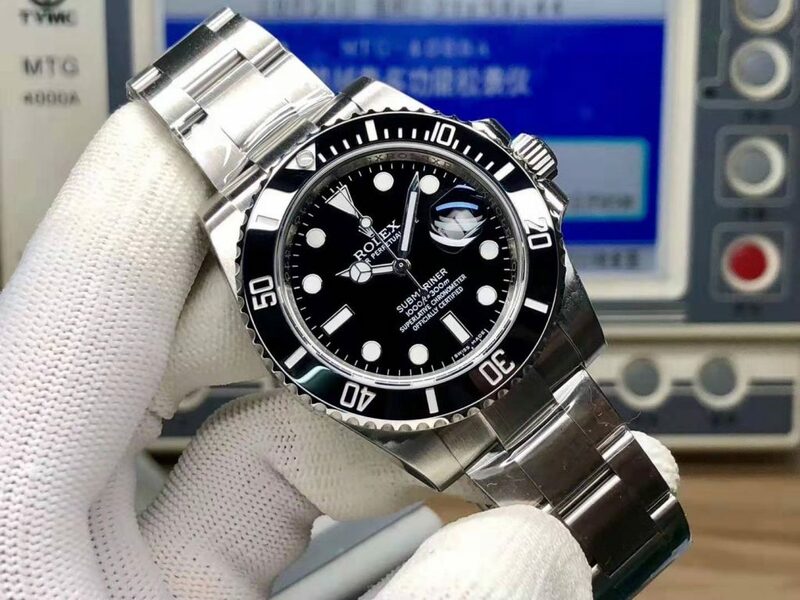 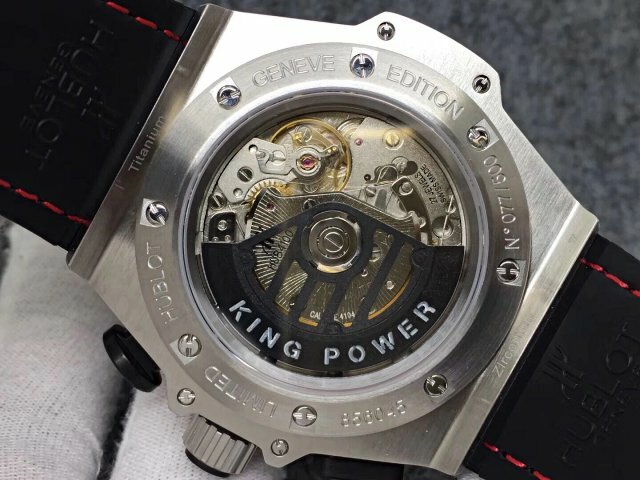 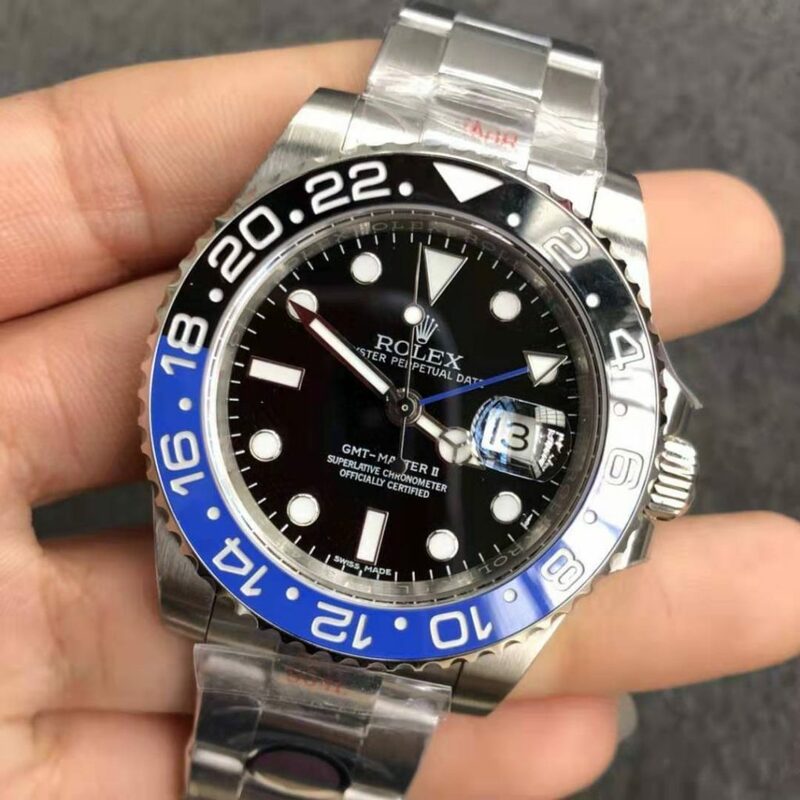 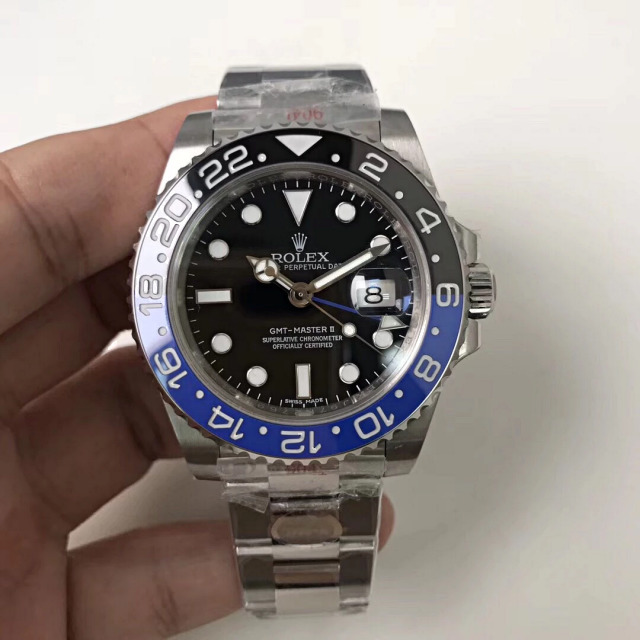 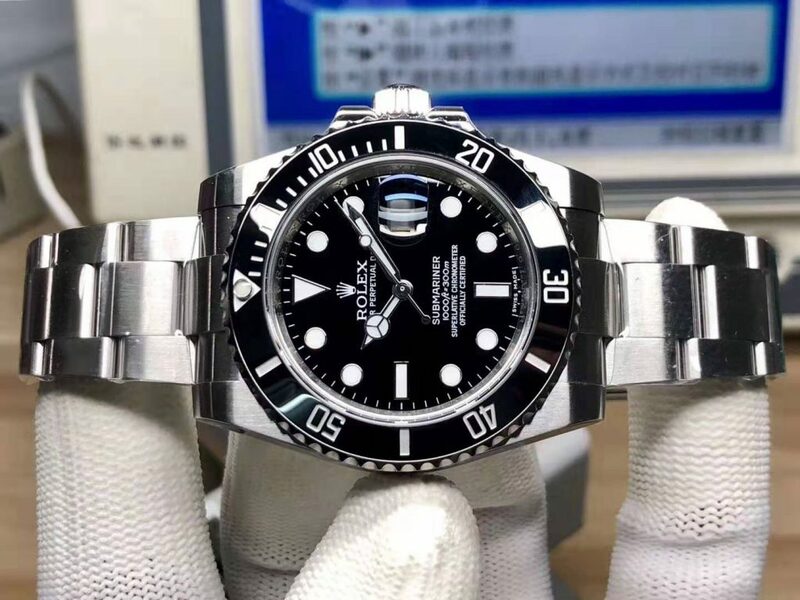 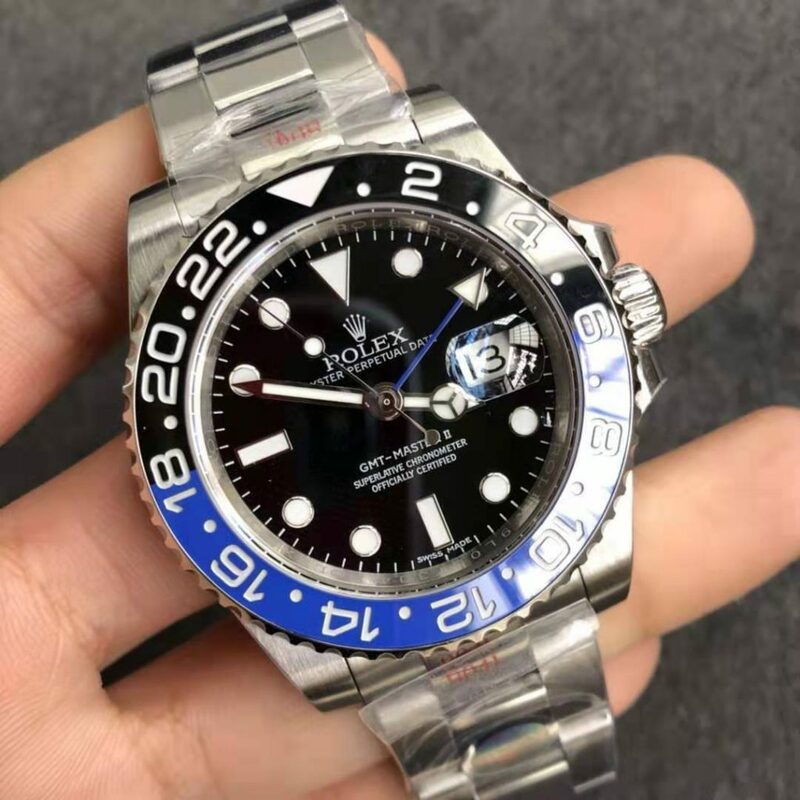 GMT hand could be adjusted via crown. 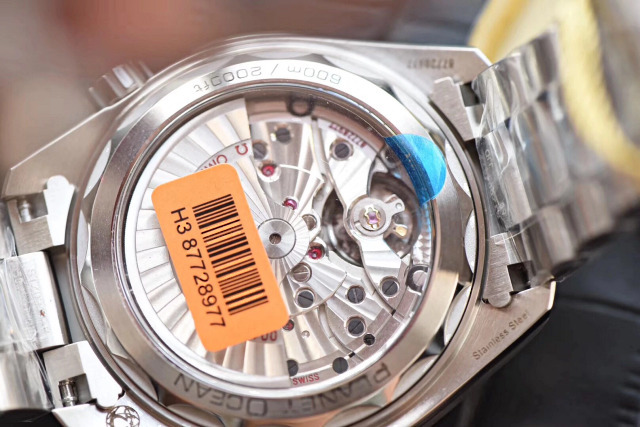 Central second hand also features an orange tip, but have you noticed one small detail? 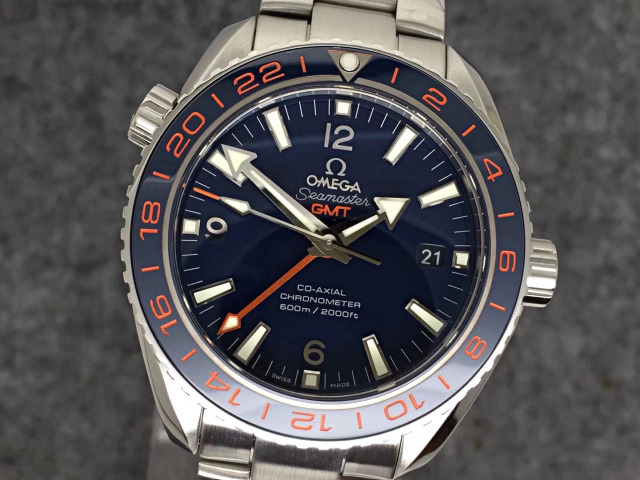 It is about the orange color used on dial and 24-hour markers, the two orange colors have different brightness, the orange bezel markers look darker, while the orange “GMT” lettering and second hand tip on the dial seem to be brighter. 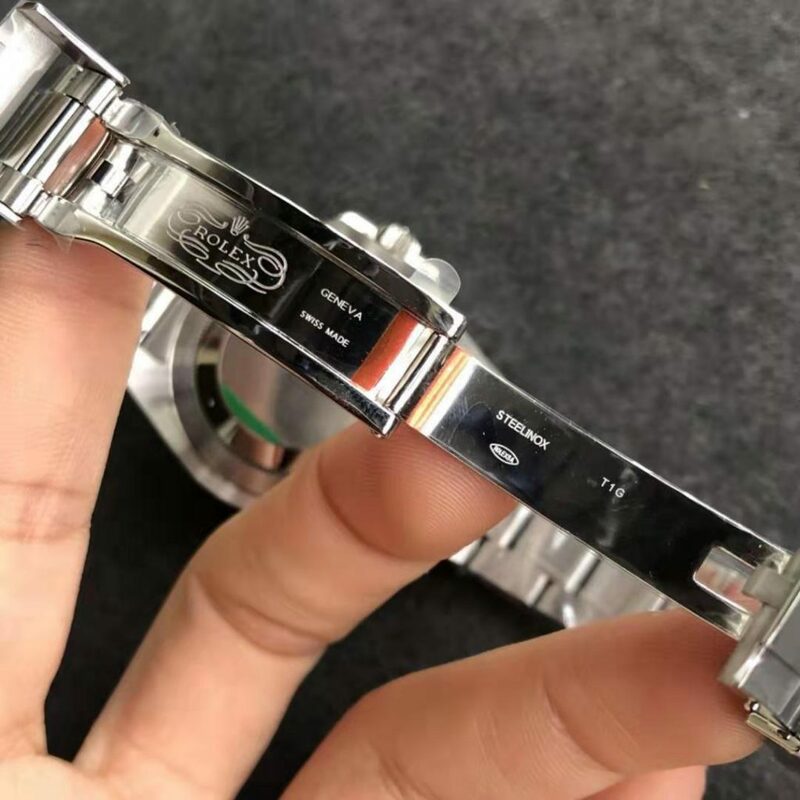 VS really cares about these details, so they became a famous watch manufacturer. 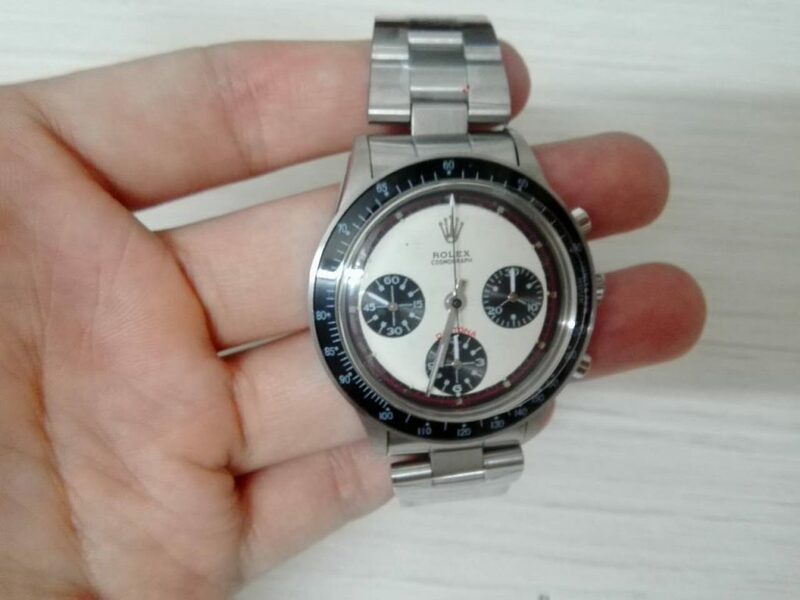 Having talked too much about the replica, now let the watch photos speak for me. 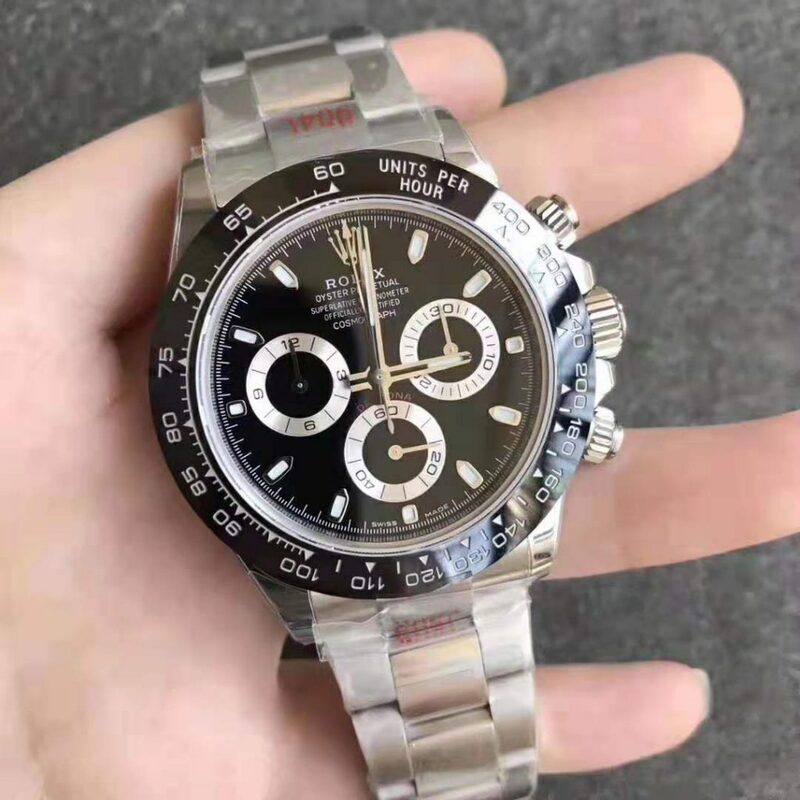 If you are interested in buying it, please feel free to contact us. 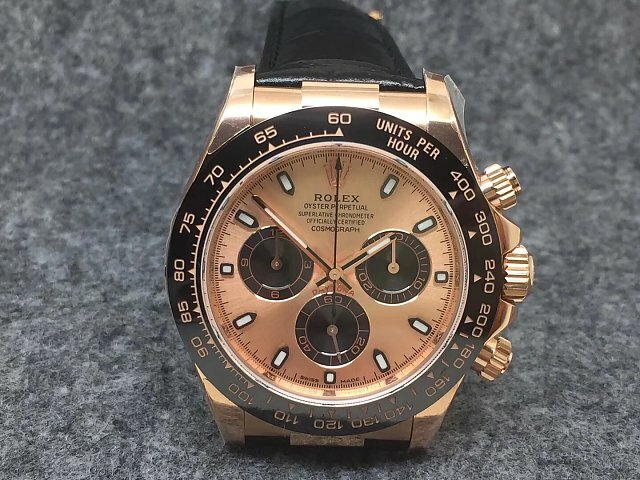 A lot of Rolex Daytona replica watches have been published in our market since the beginning of 2018, AR and Noob are two main factories that manufactured these Daytona replicas. 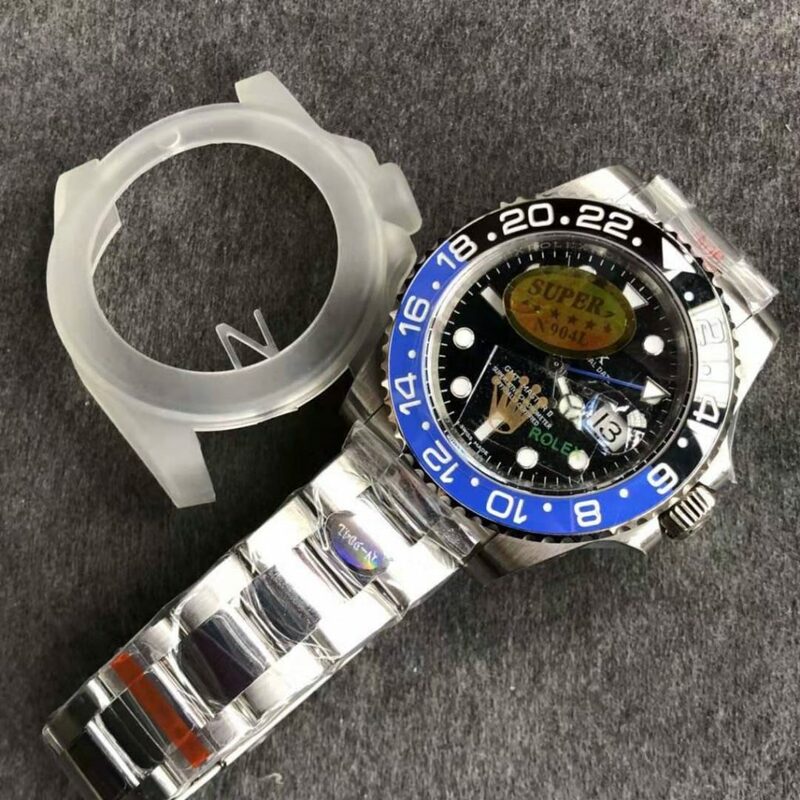 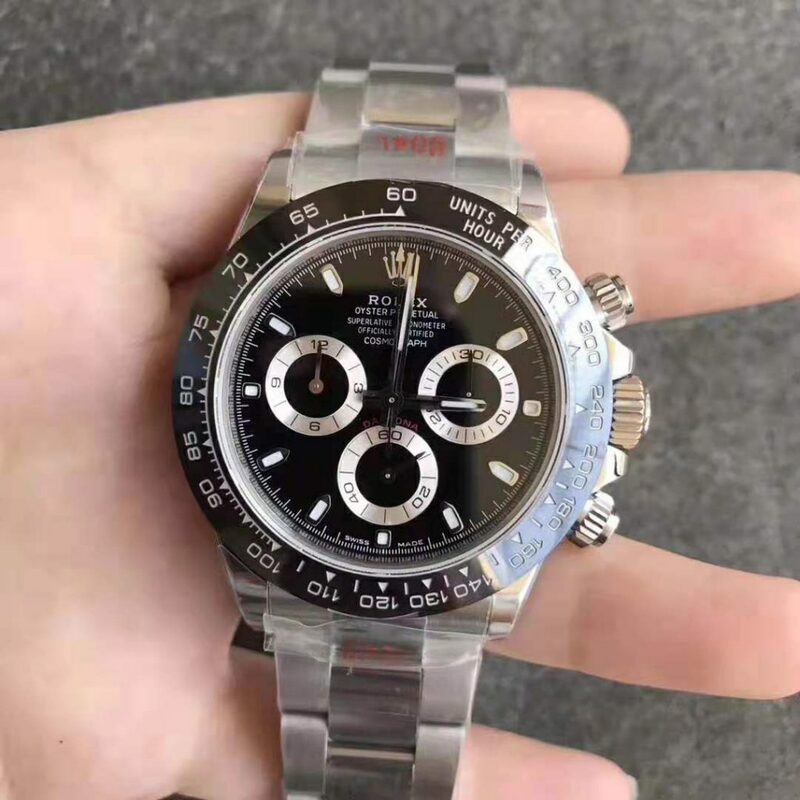 The quality from both factories is good, but there is a big difference between Noob Daytona and AR Daytona. 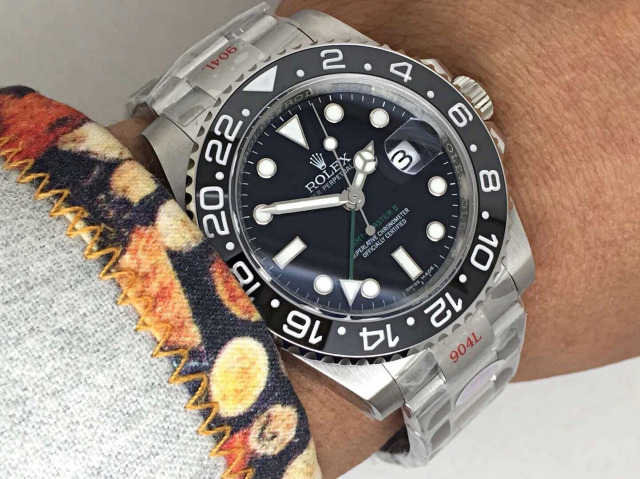 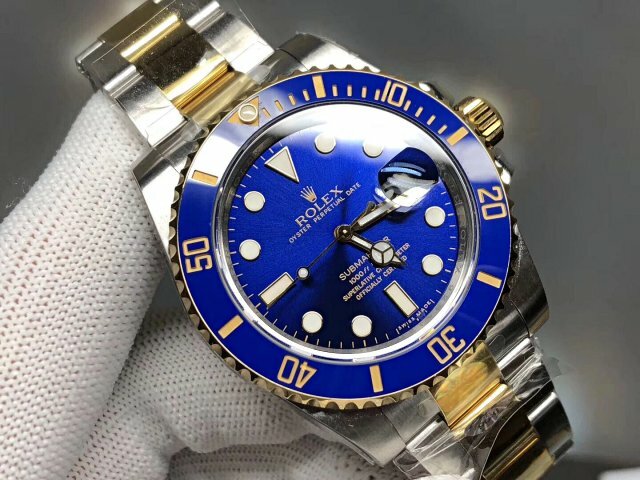 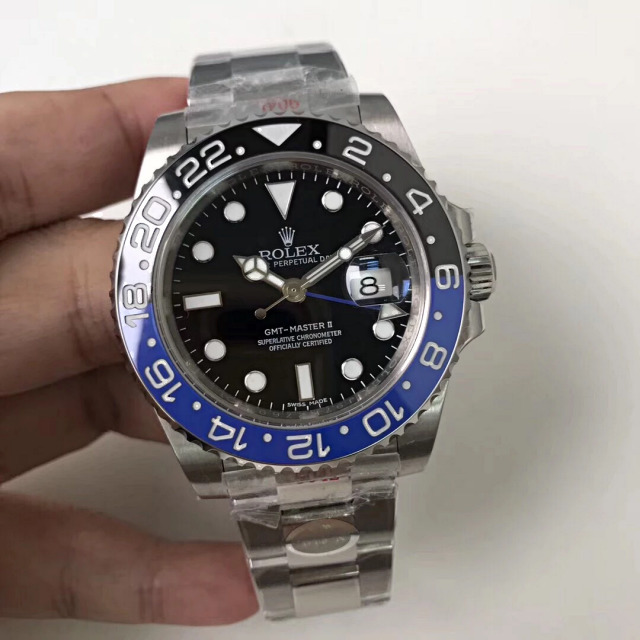 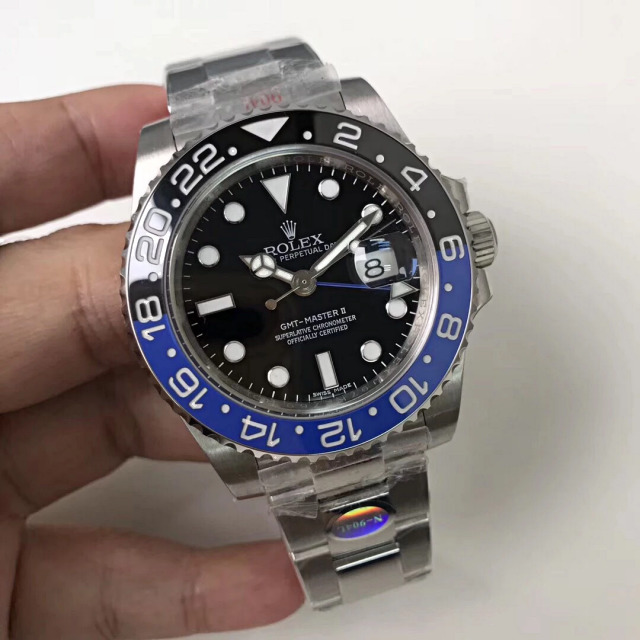 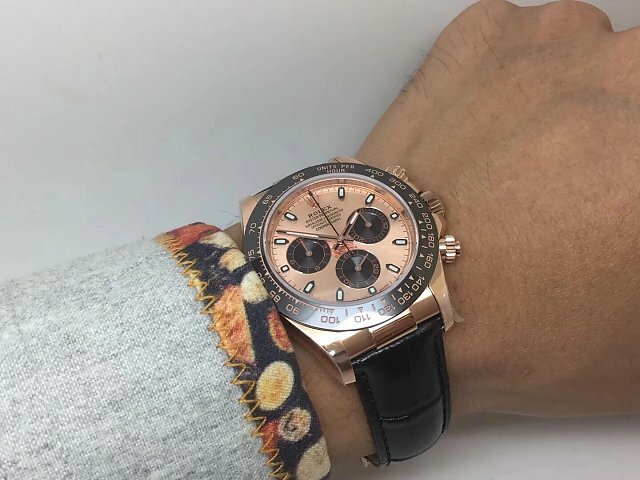 In my opinion, Noob makes the best replica Rolex, including these Daytonas, maybe some people do not agree, but this is the truth. 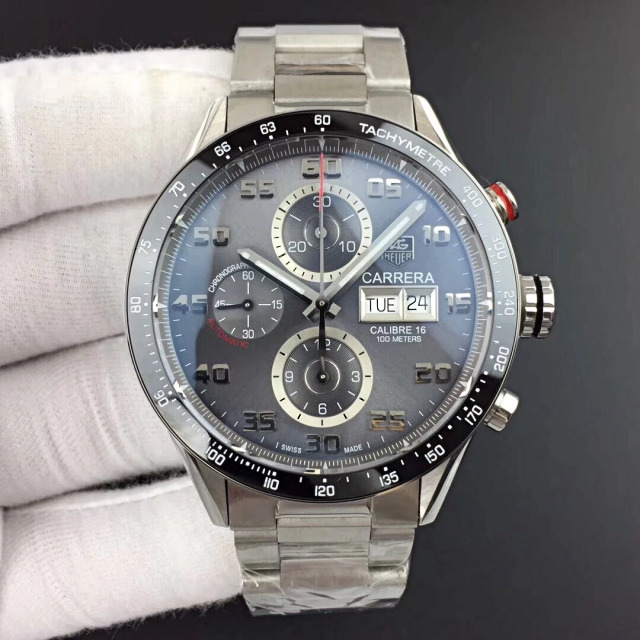 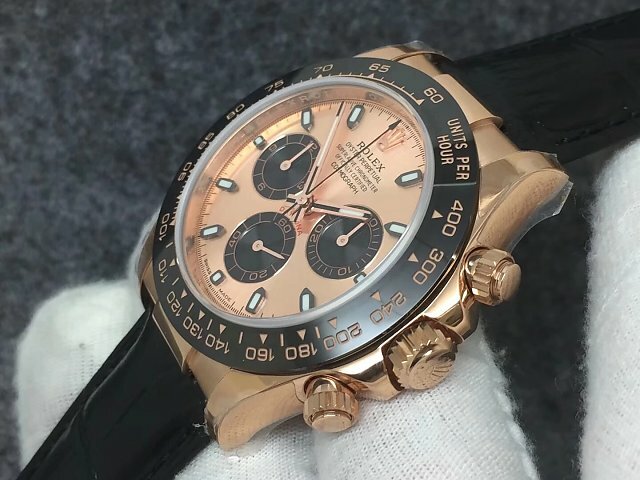 Noob not only used 904L stainless steel on the case, but also now installed the super clone 4130 movement in the Daytona, this type of super clone 4130 has a full functional chronograph. 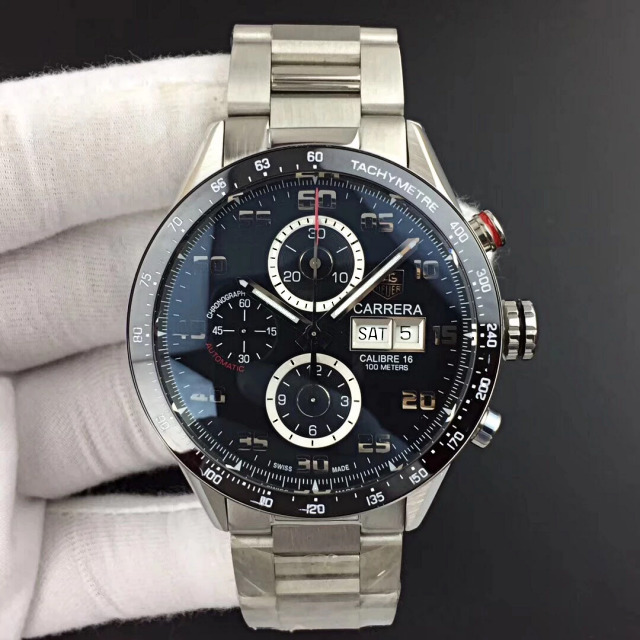 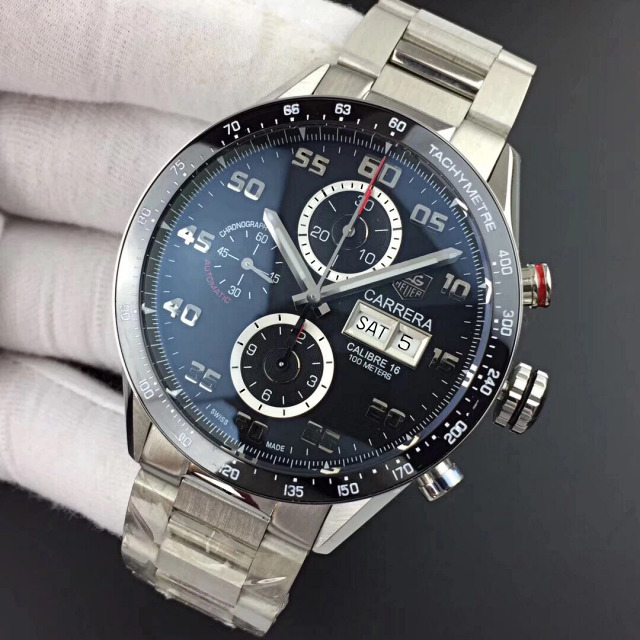 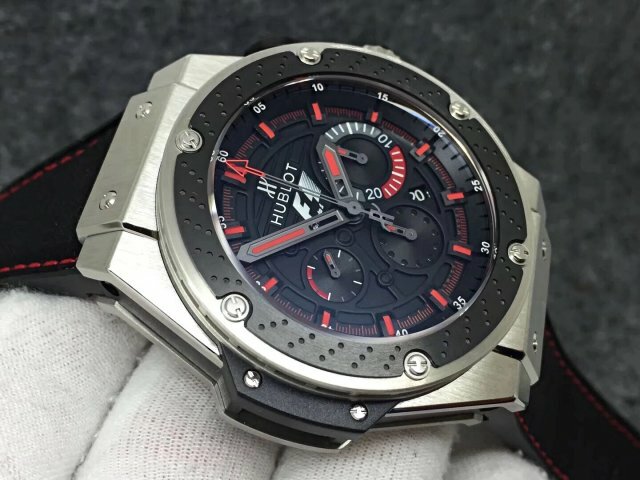 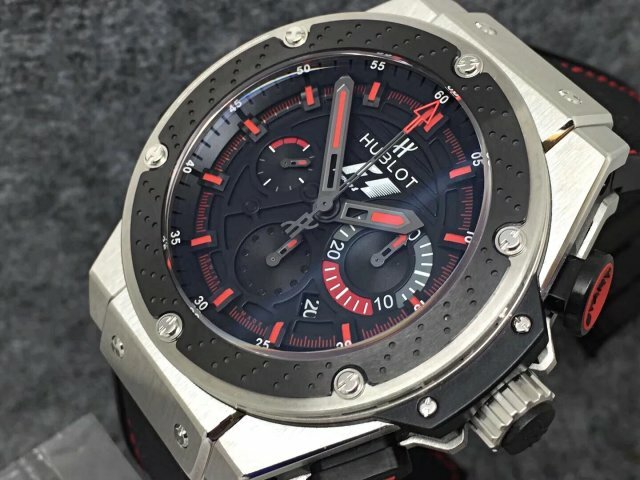 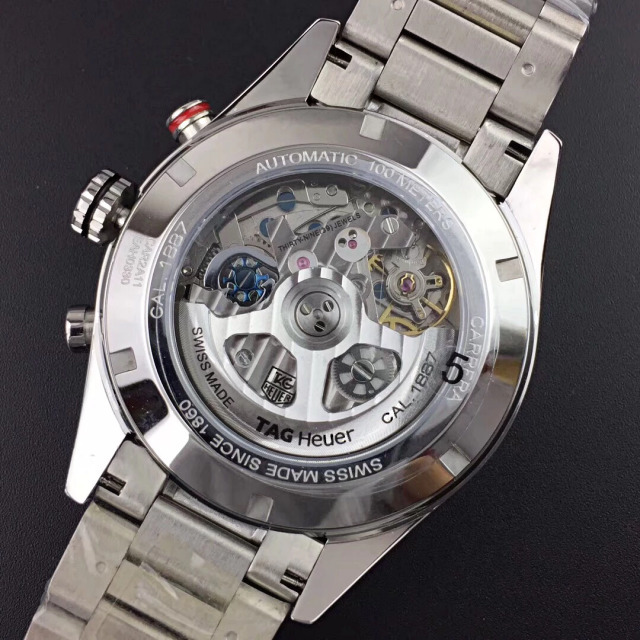 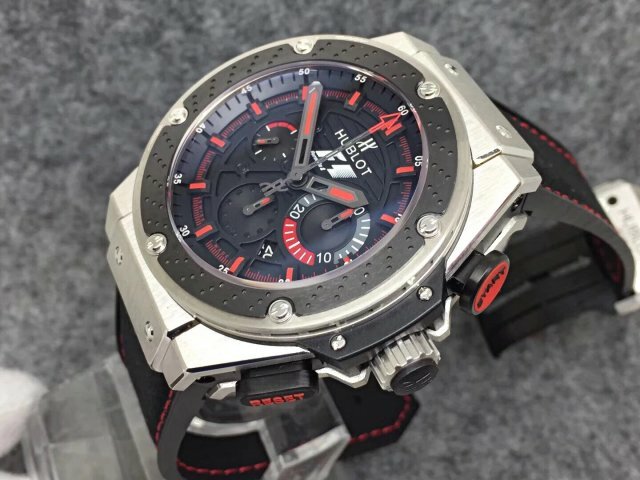 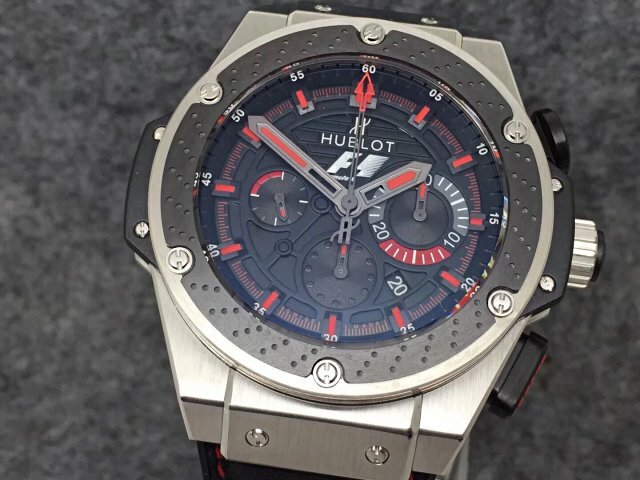 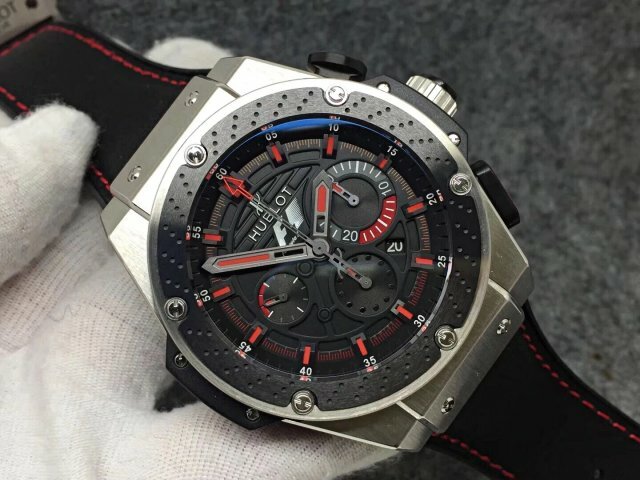 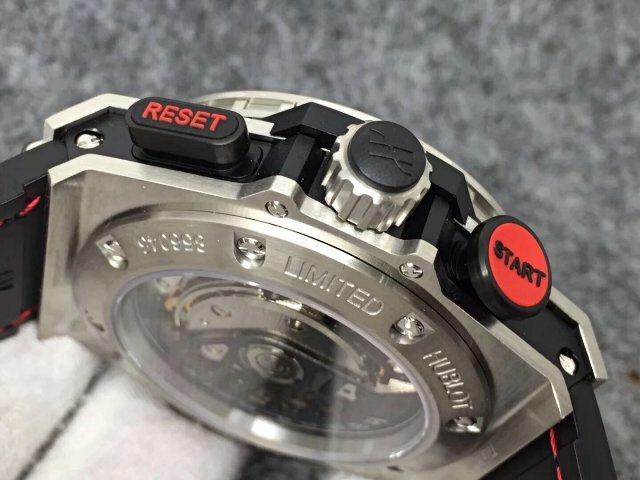 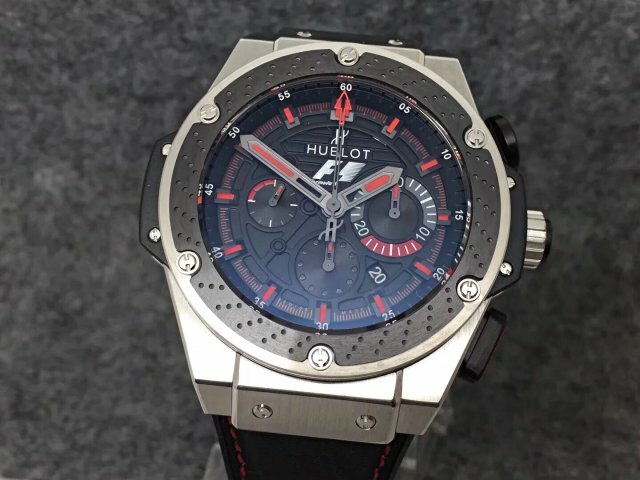 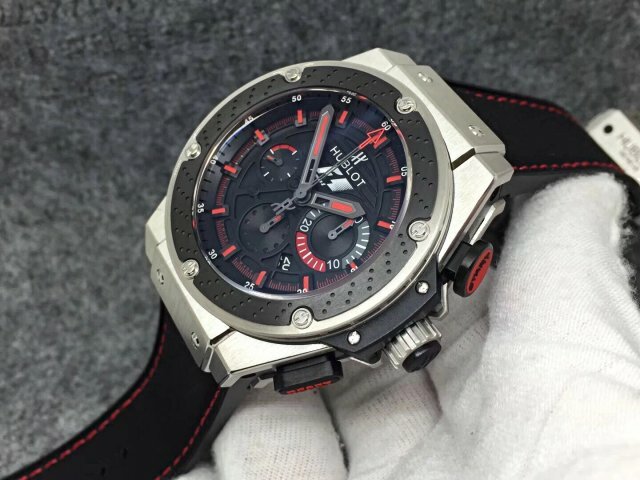 Although AR has their clone 4130 movement, but it does not have a real chronograph, a bit disappointed. 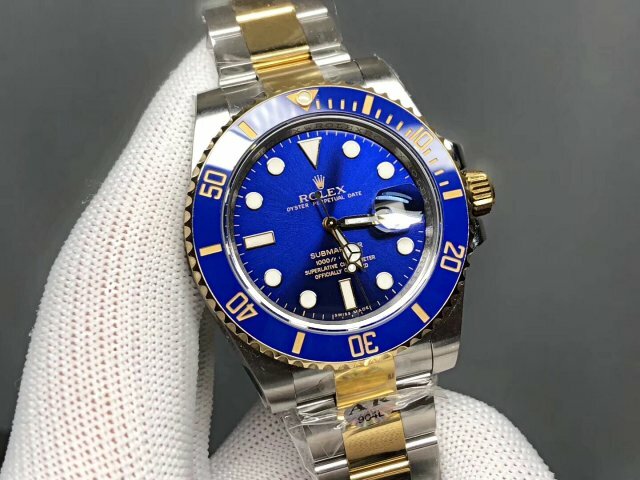 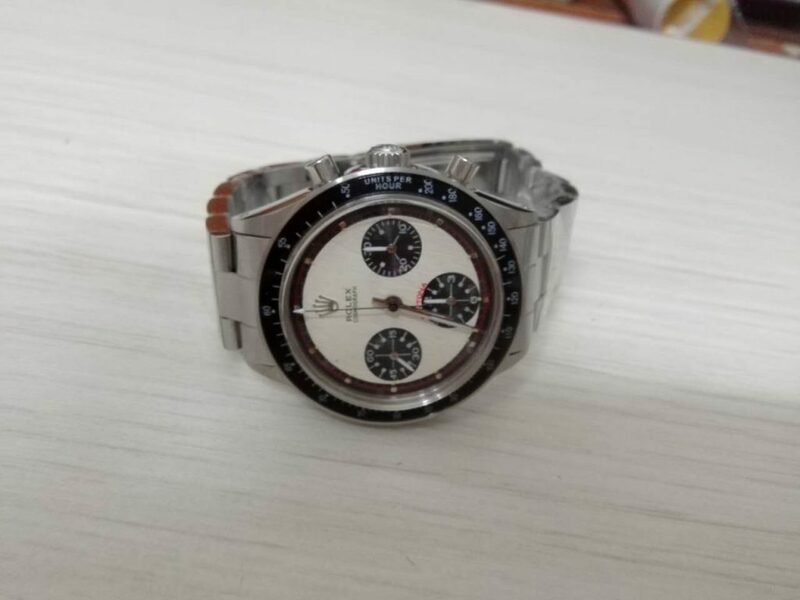 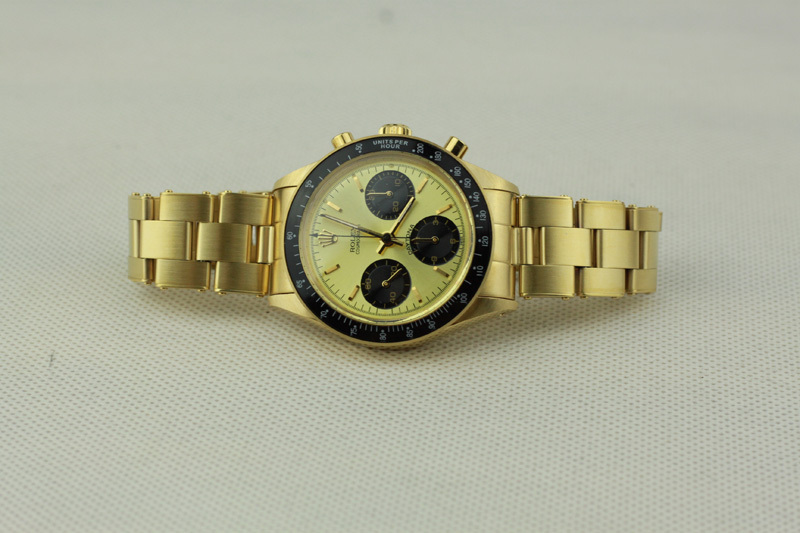 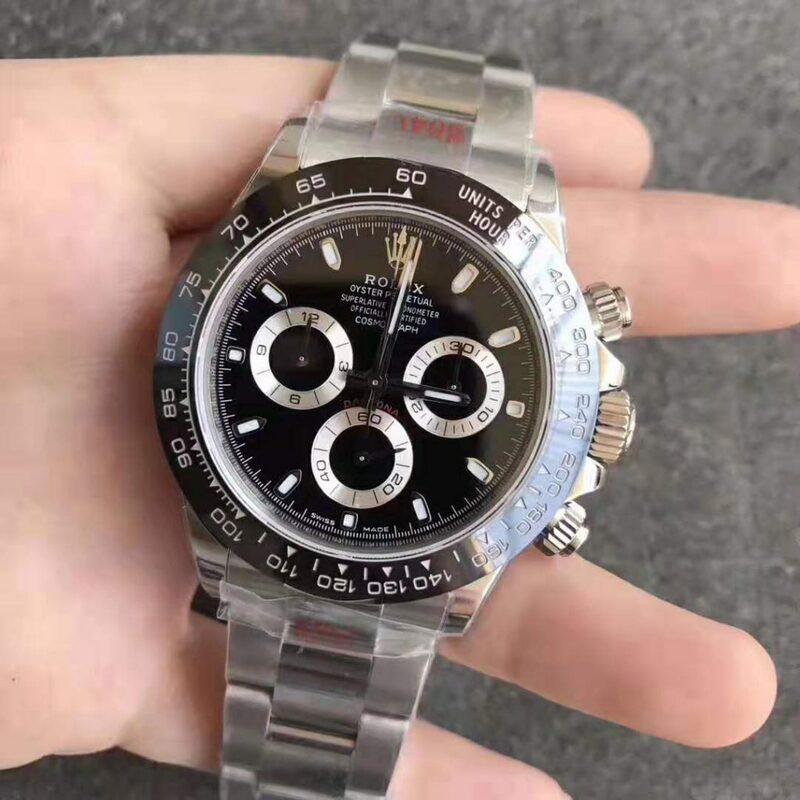 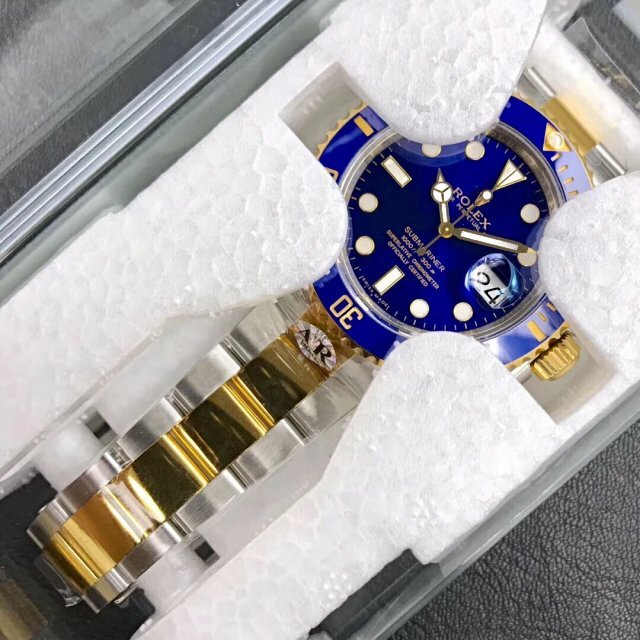 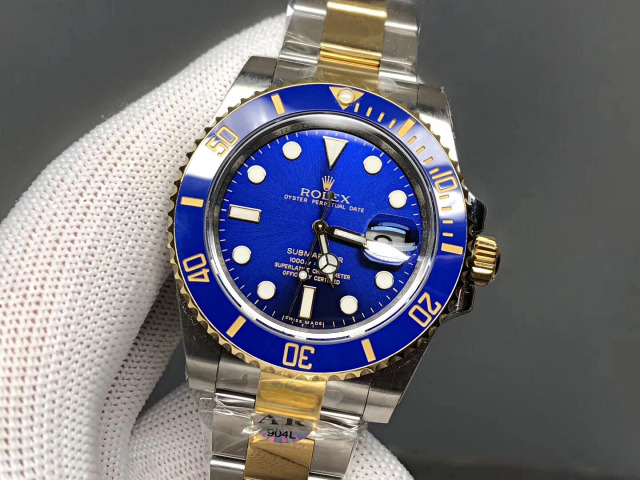 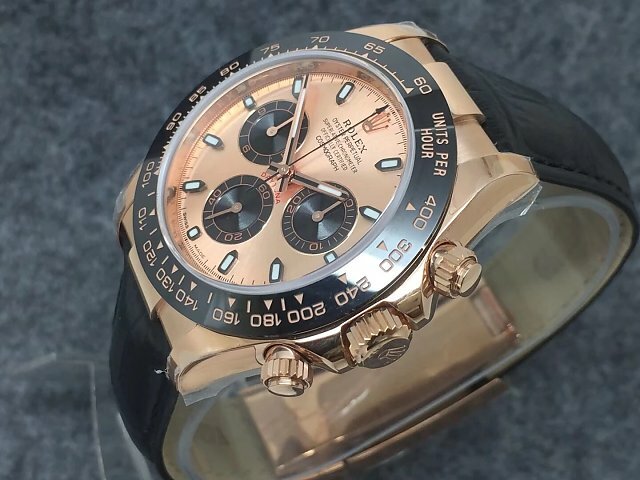 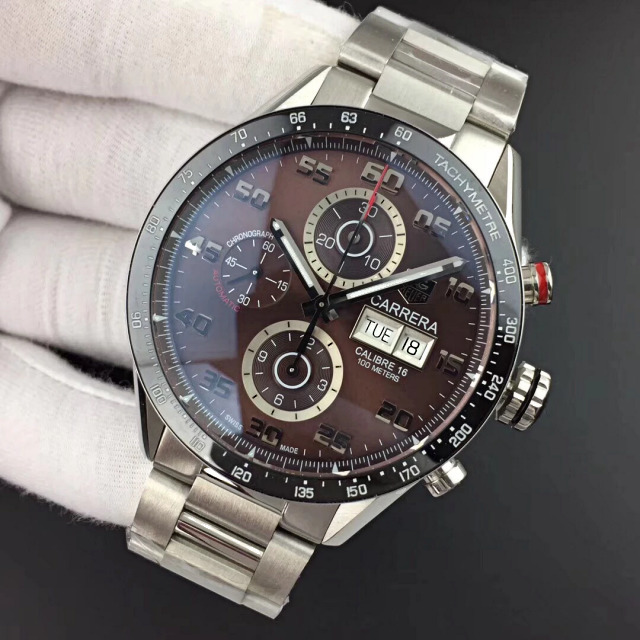 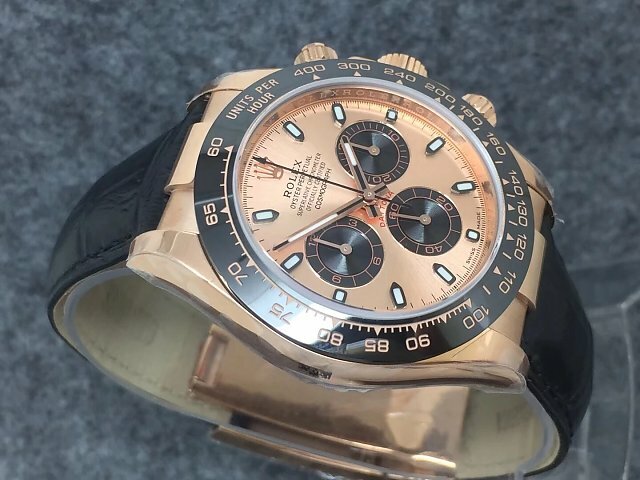 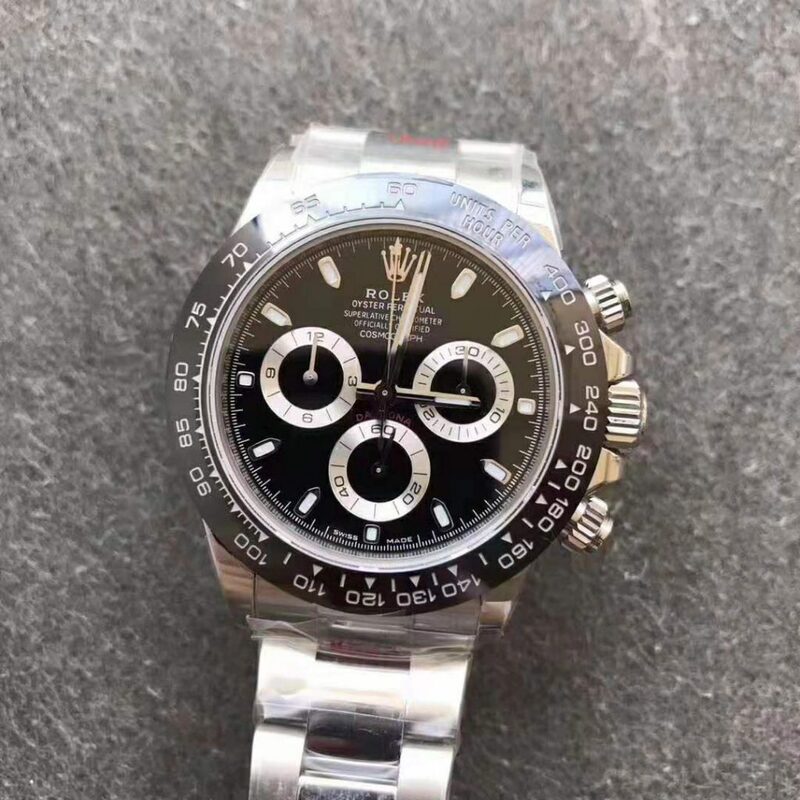 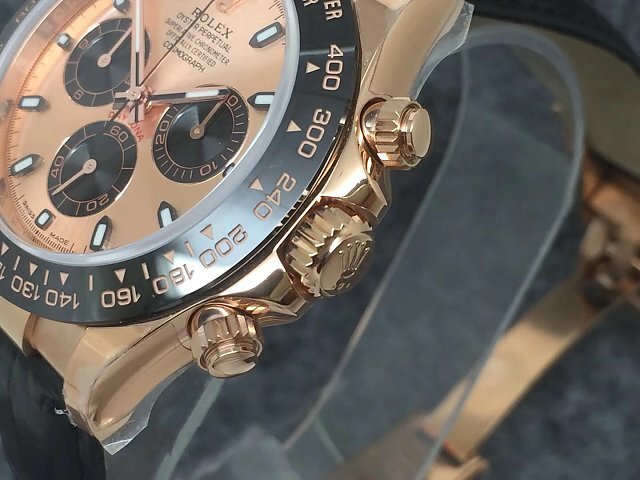 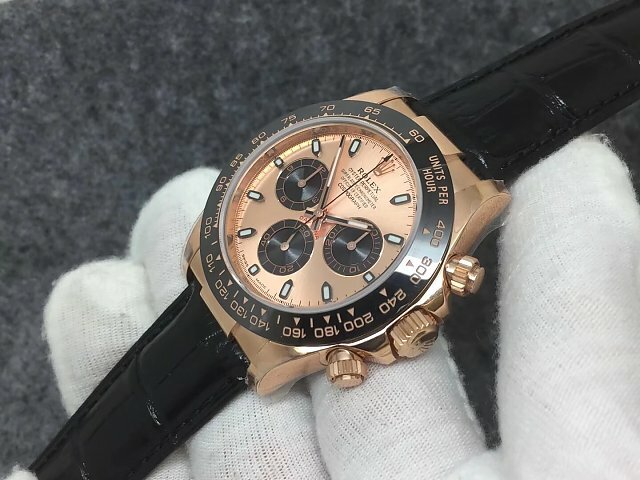 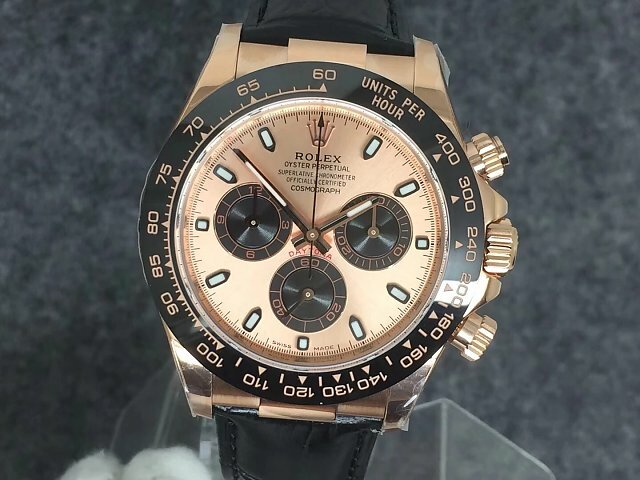 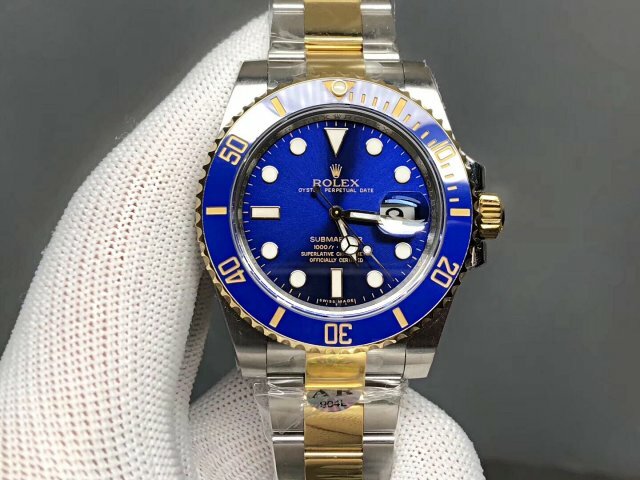 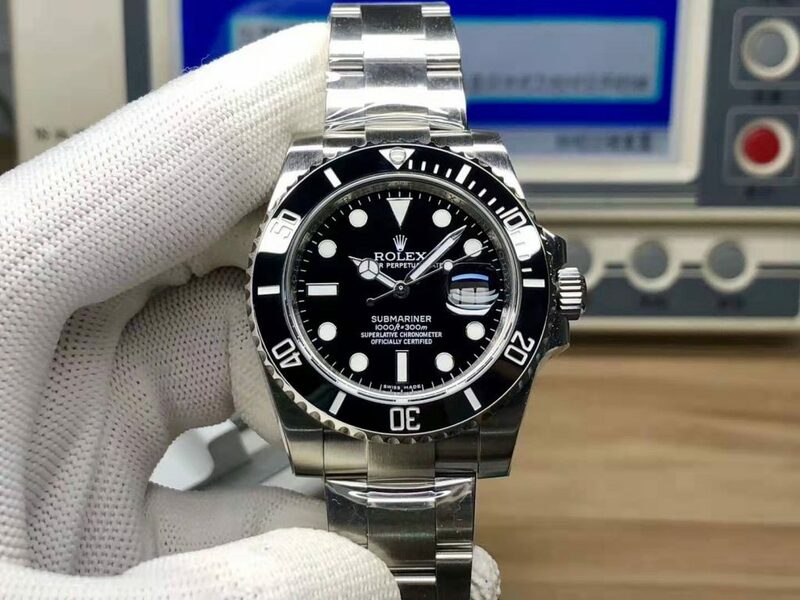 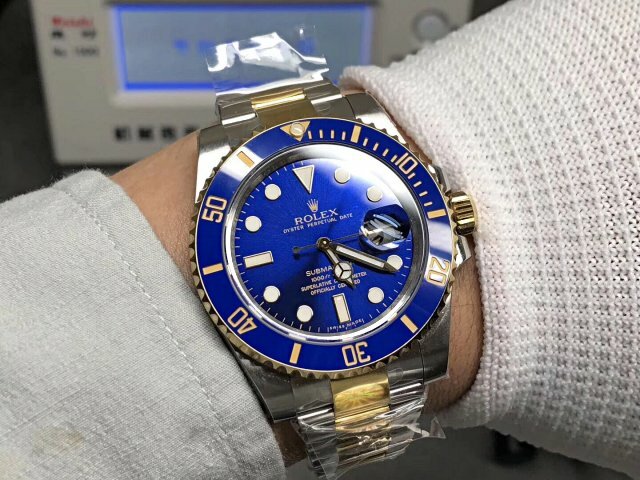 Today, I want to introduce another good replica Daytona made by Noob factory, genuine watch has a reference number 116515, this rose gold Rolex Daytona watch is currently the best Daytona replica, you can not find any other Daytona watches in our market that could be compared with this one. 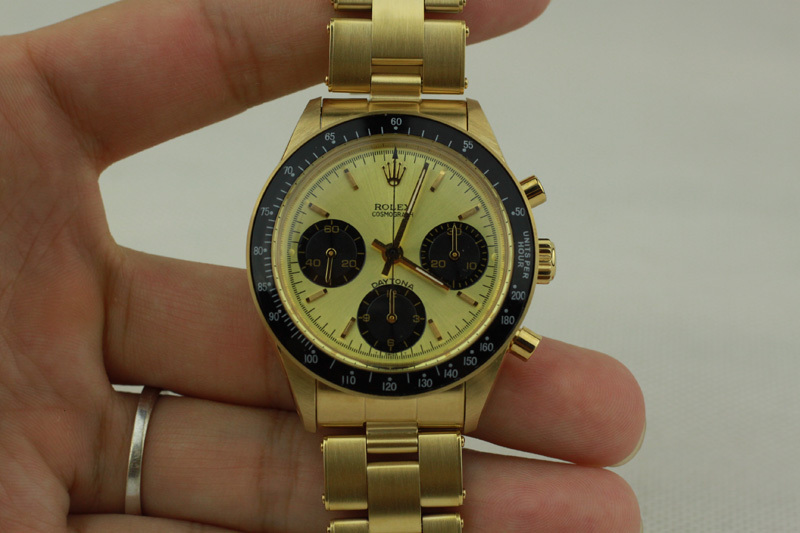 About this Daytona, the most important change AR factory has made lies in its movement. 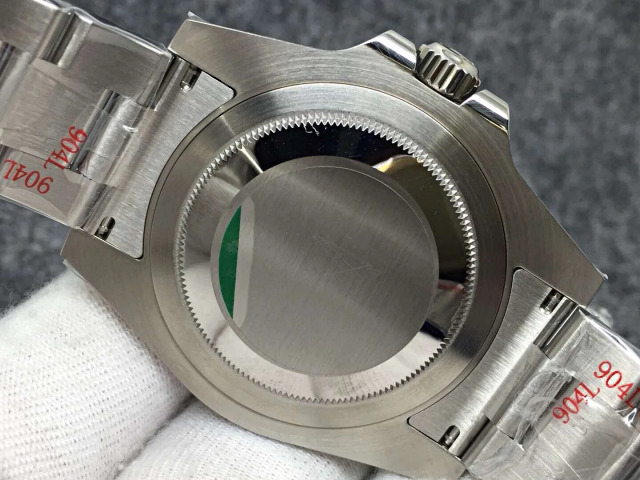 The factory used an original KIF shock absorber on this super clone 4130. 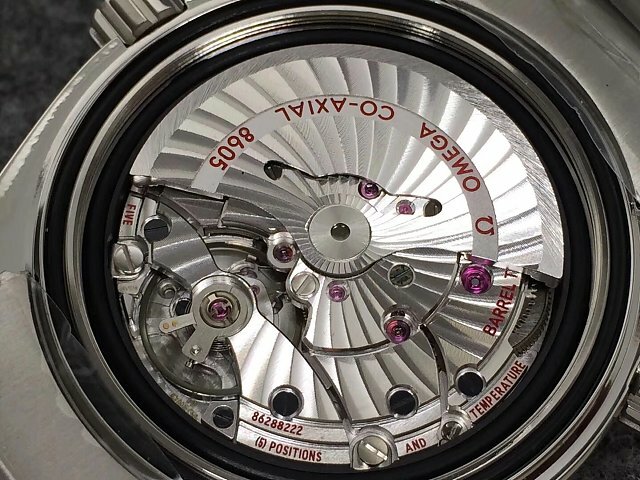 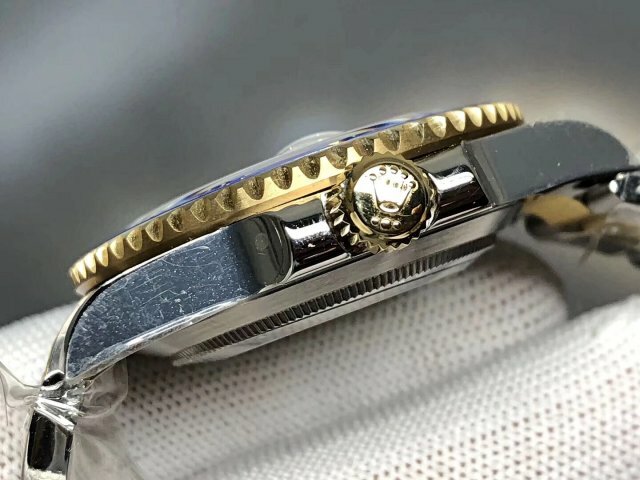 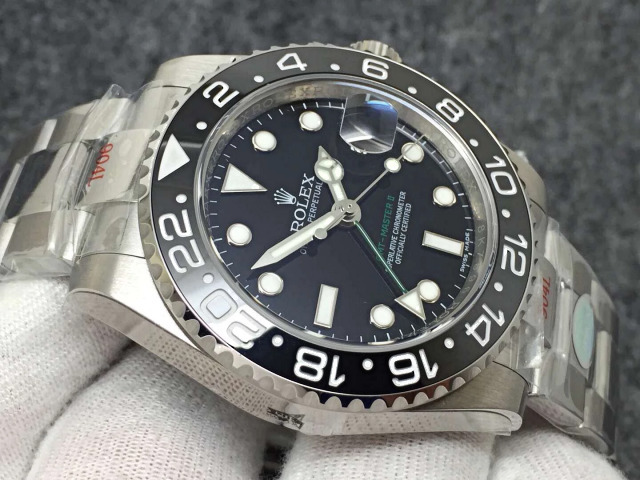 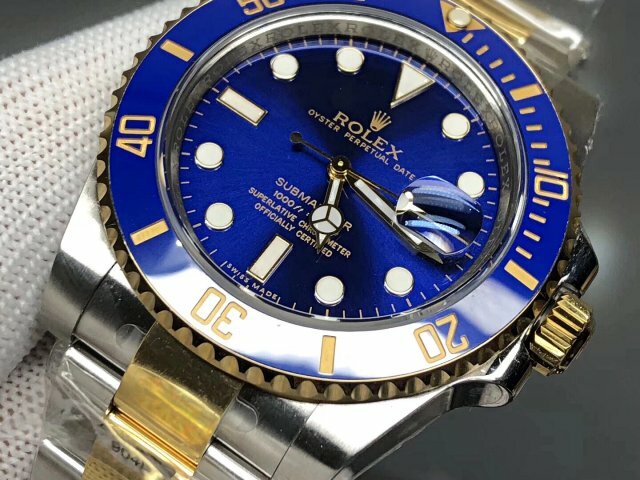 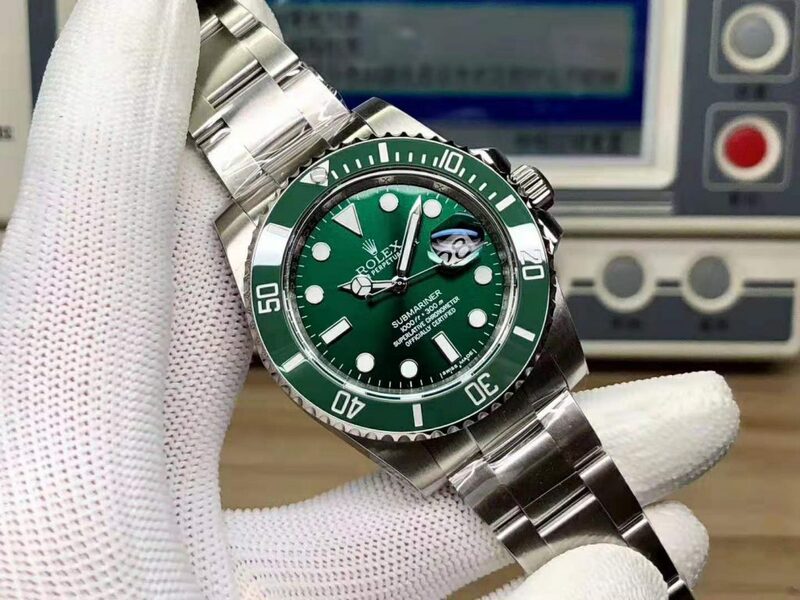 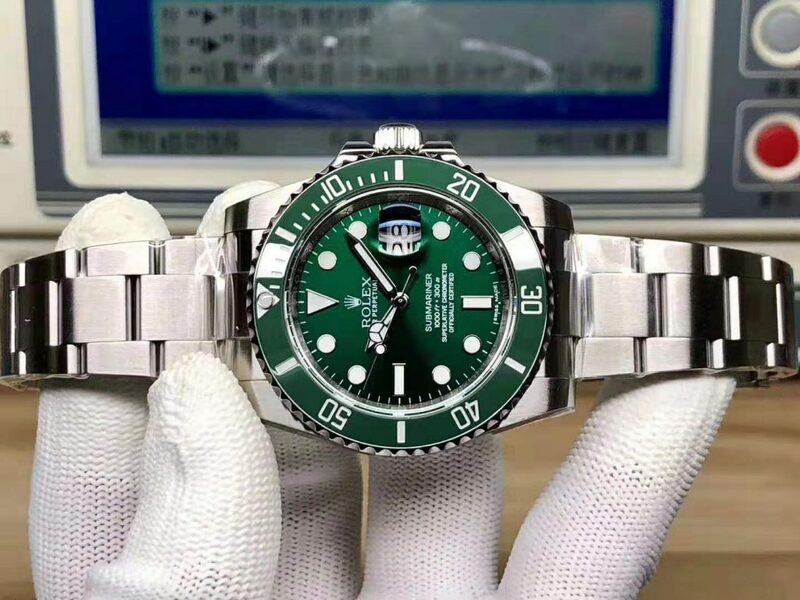 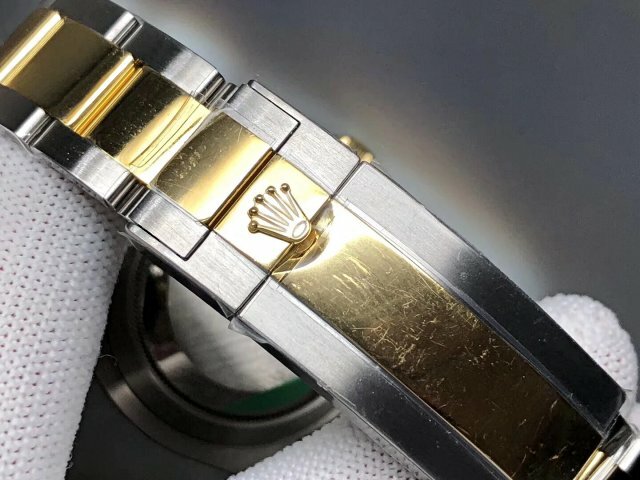 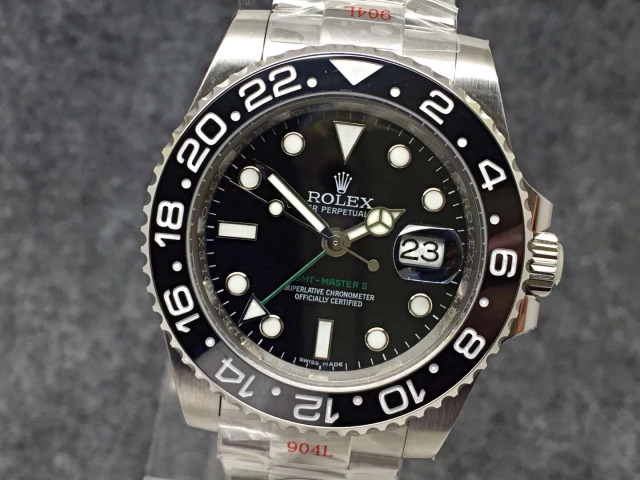 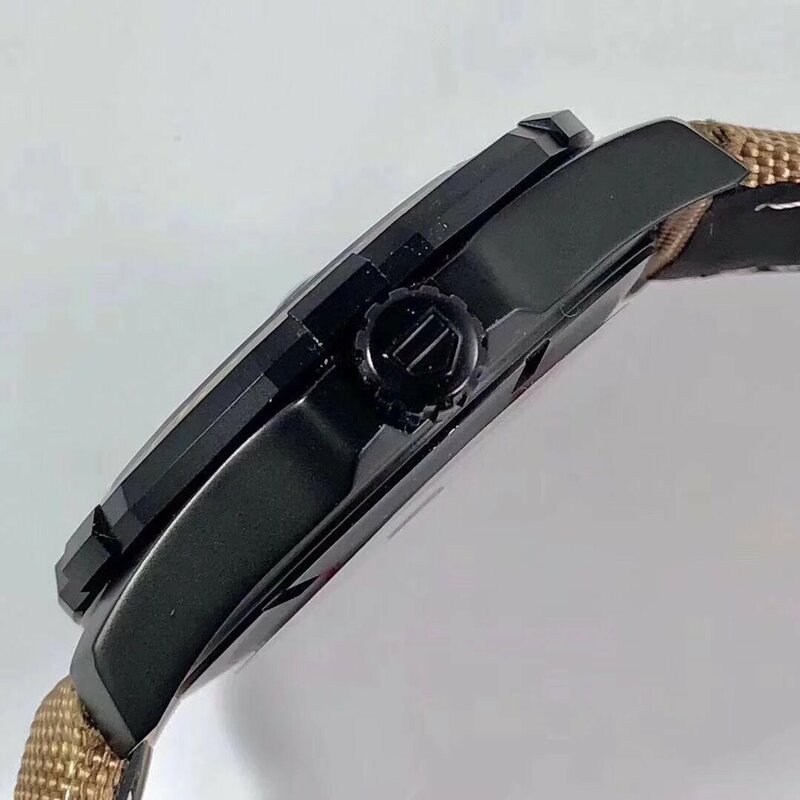 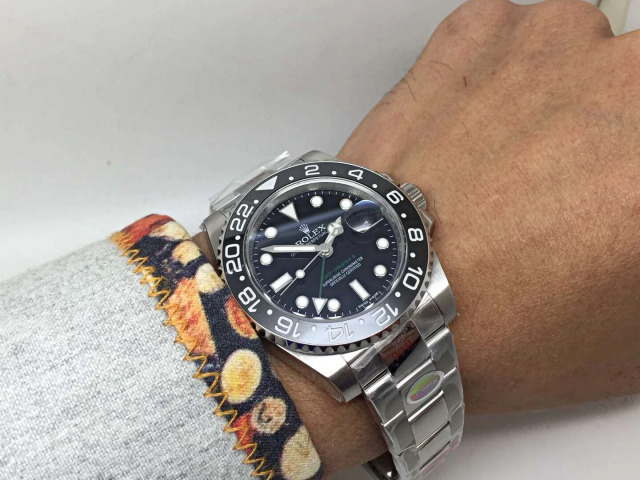 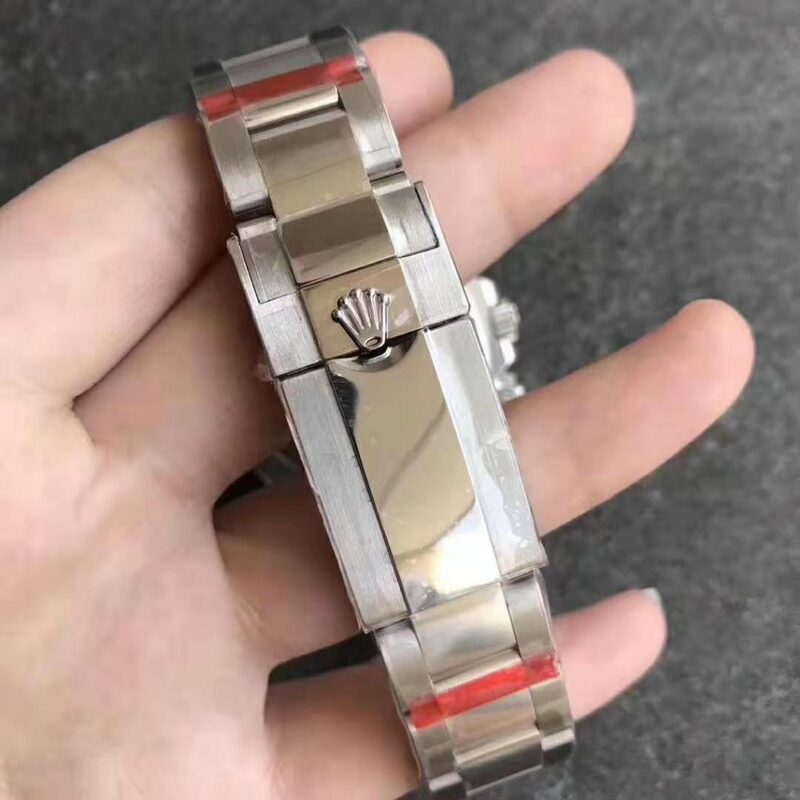 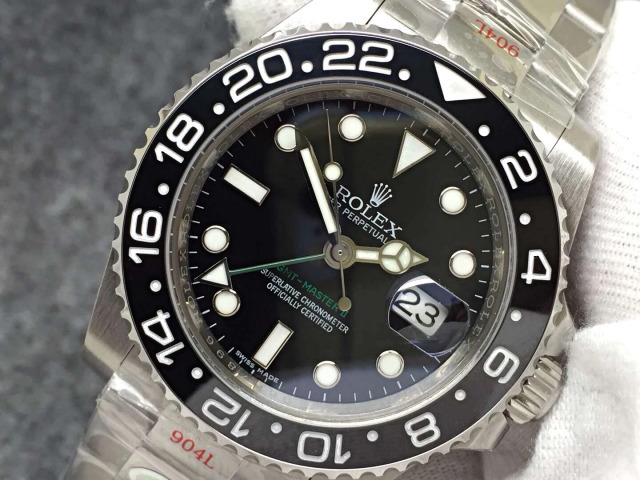 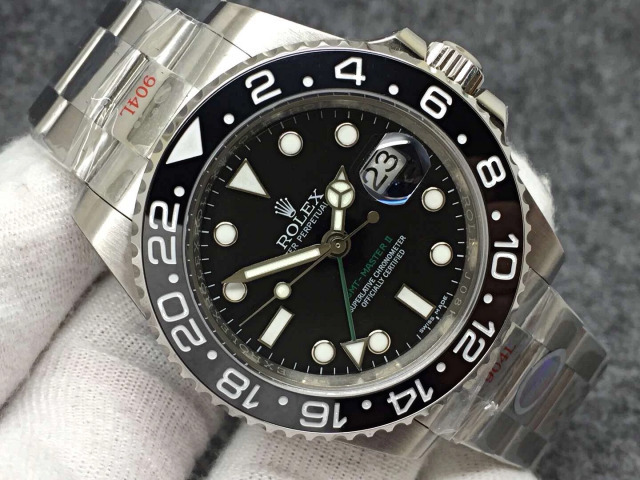 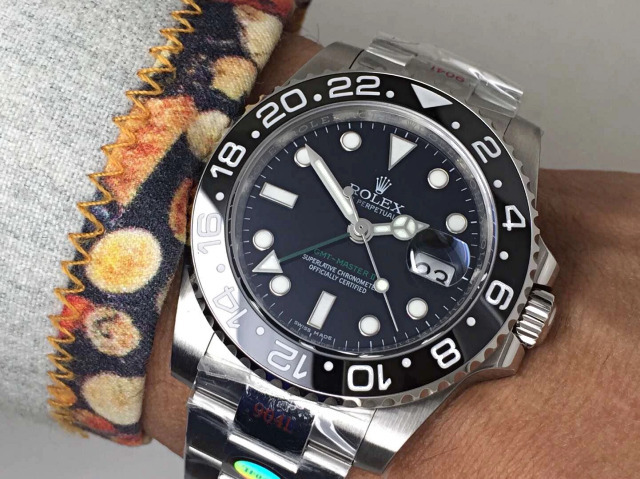 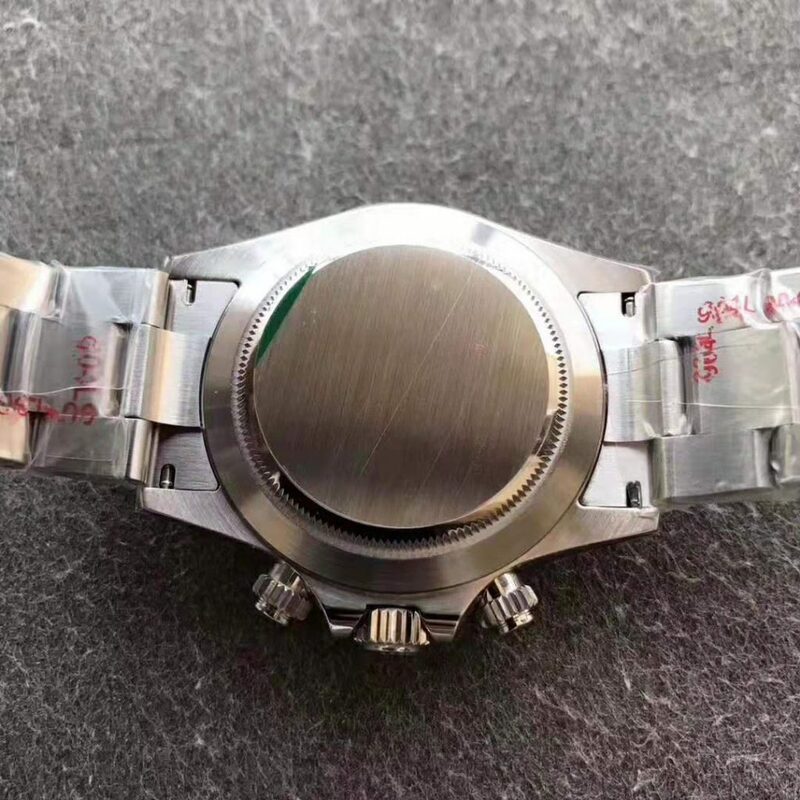 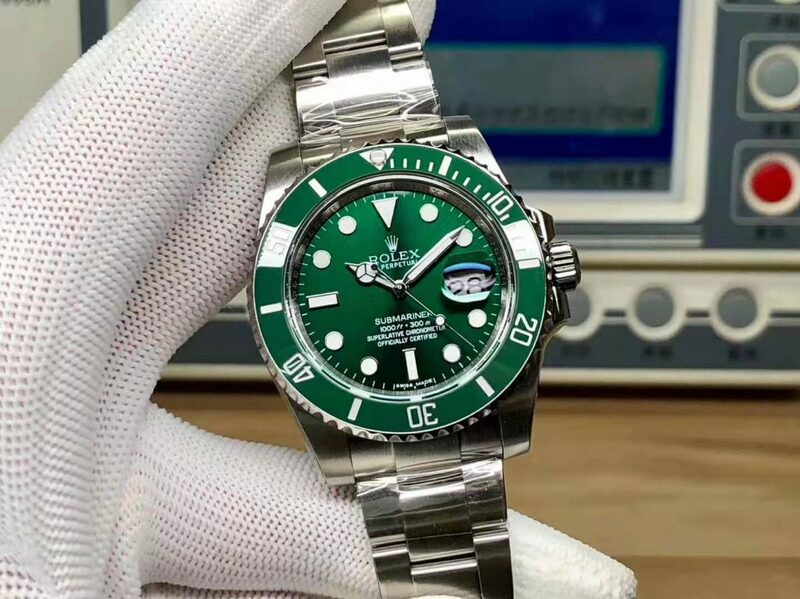 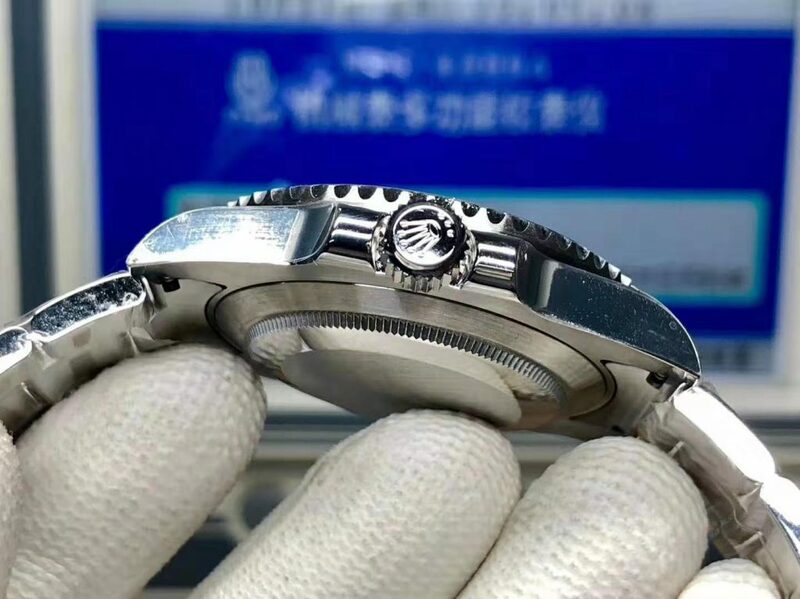 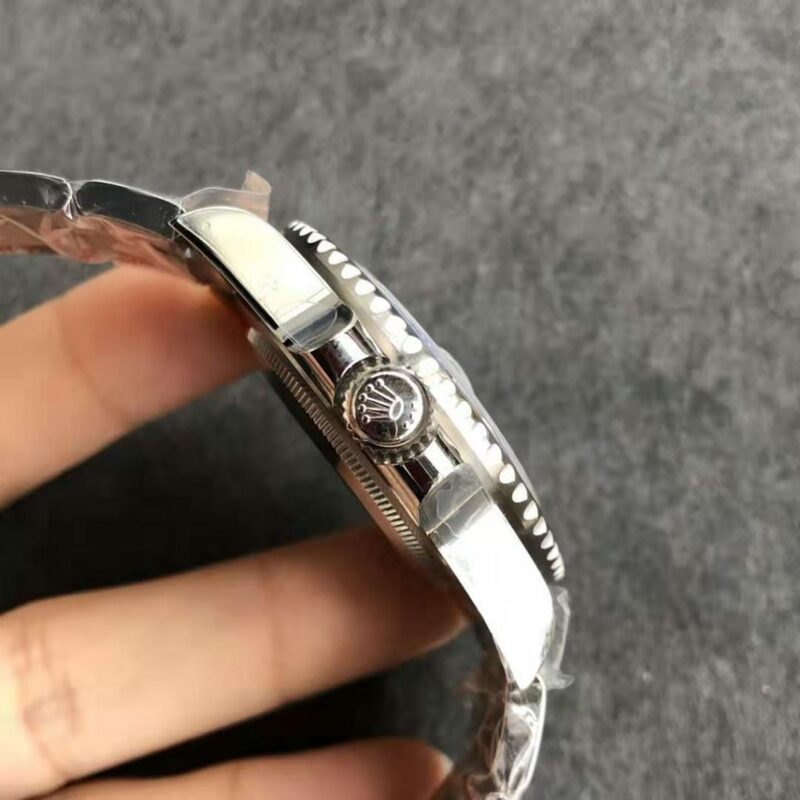 On movement plates, from chamfering to sun-ray polishing, they do a respect to original design, the outlook is completely the same as genuine Rolex 4130 Caliber. 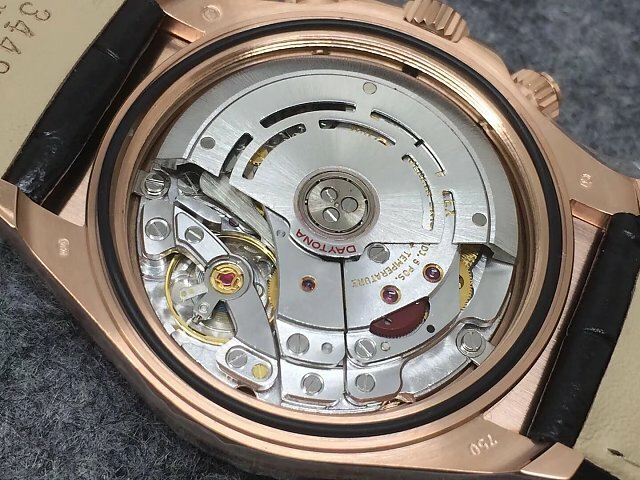 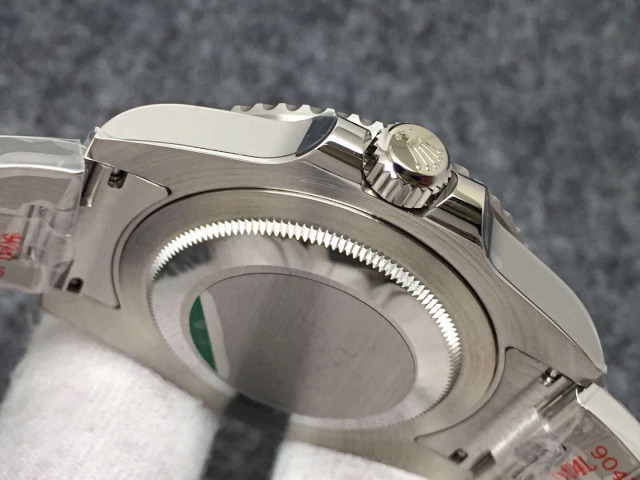 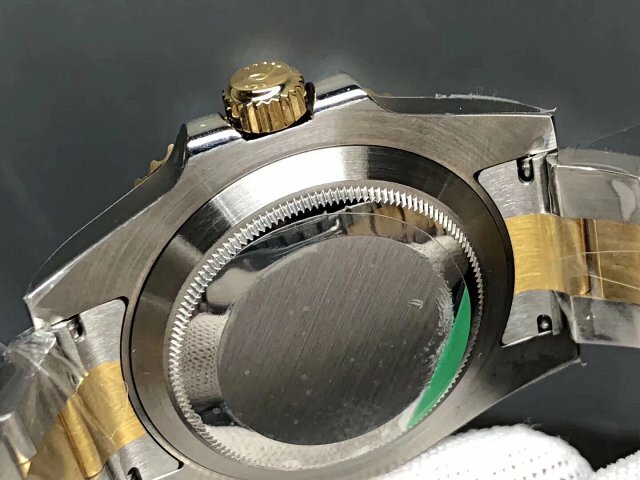 Compared with previous Asian Valjoux 7750 movement, this super clone 4130 has correct thickness, not that thick on Asian 7750. 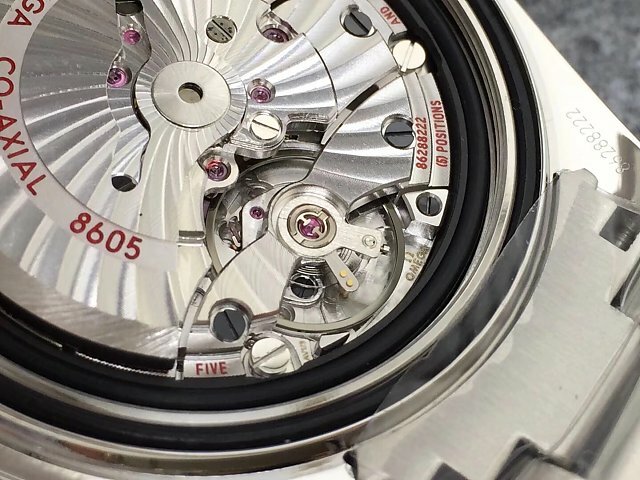 Checked the movement photos below, do they look beautiful? 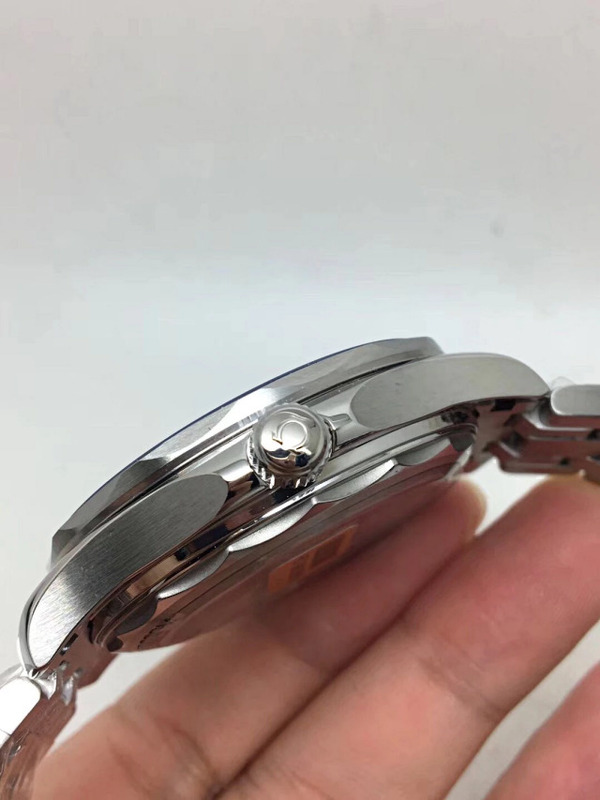 The polishing and engravings are correct, because of original KIF shock absorber, the clone 4130 movement has a high stability and accuracy. 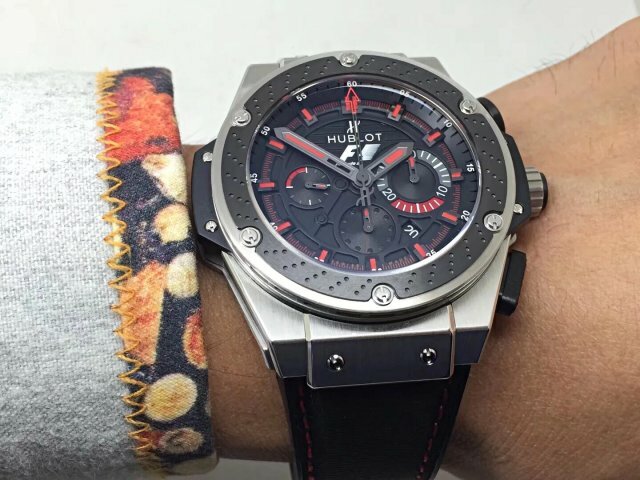 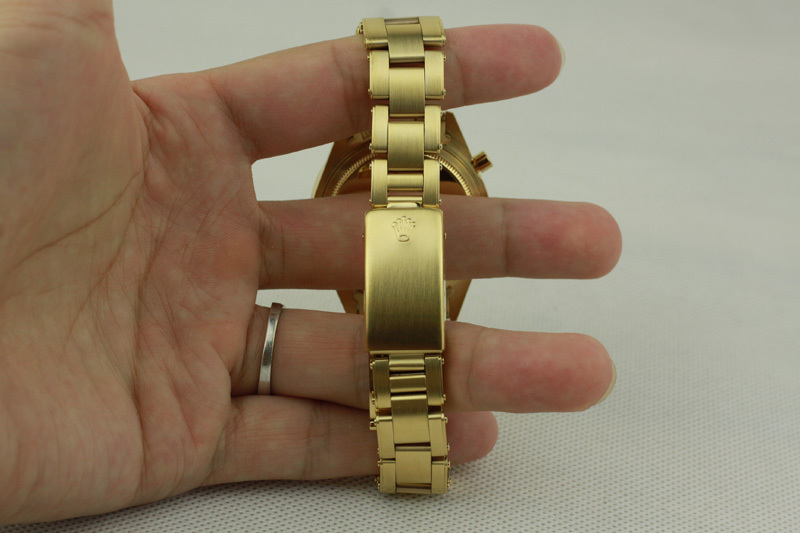 40mm case is made of 316L stainless steel, there is a thick coating of 18K rose gold, which is measured to be 5 mils. 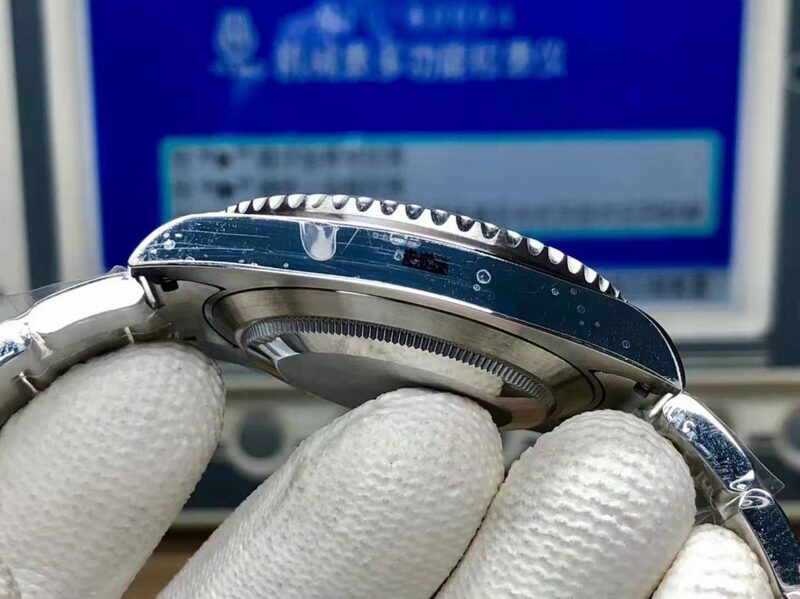 The case is brushed, while the four lugs and case side are polished. 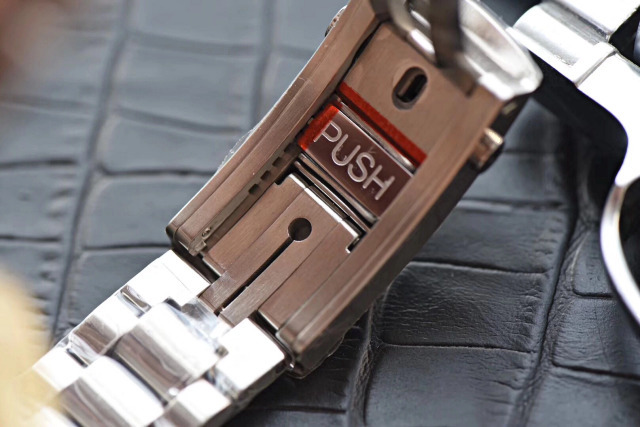 Case lugs have a curved line so the whole case can fit your wrist very well. 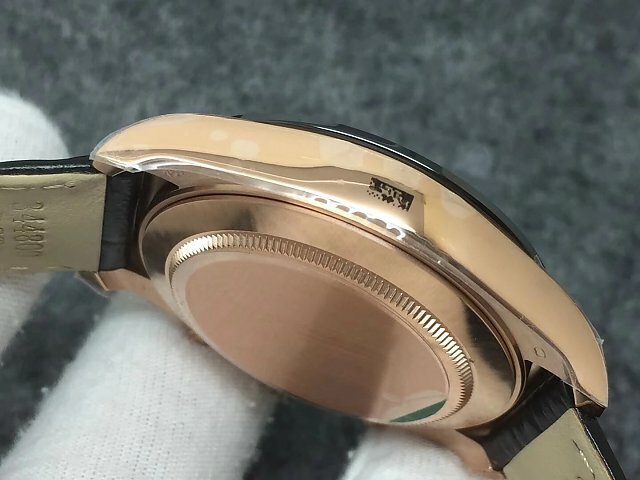 Do not worry that the rose gold tone will fade, it will not because the rose gold coating is so thick. 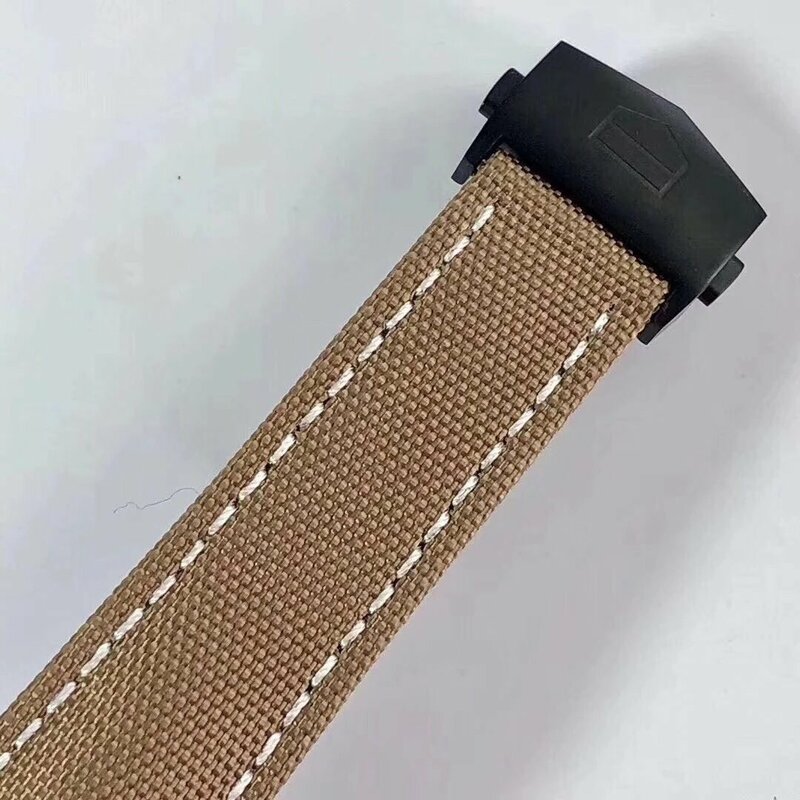 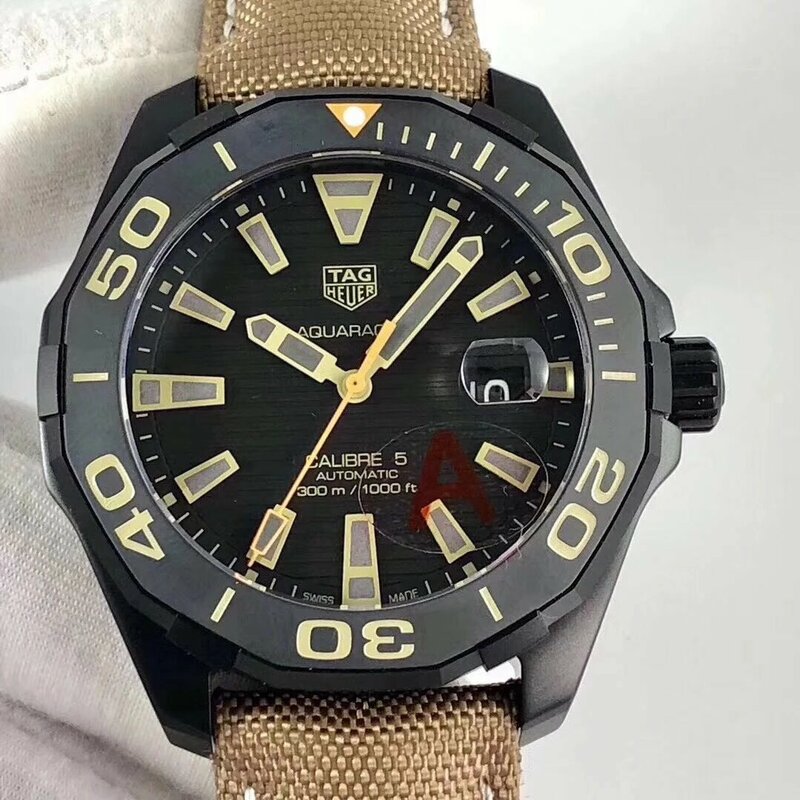 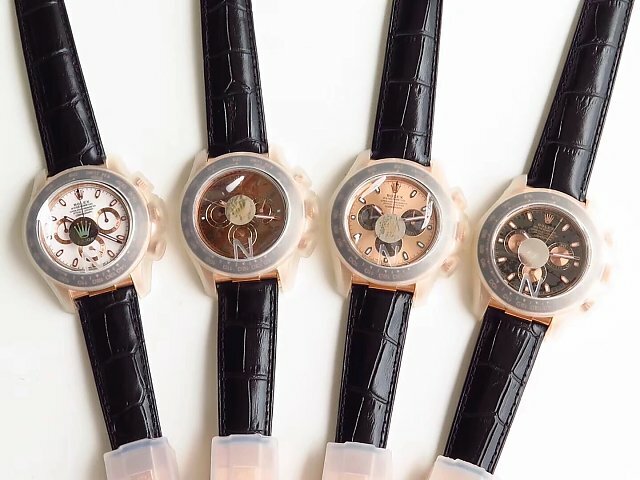 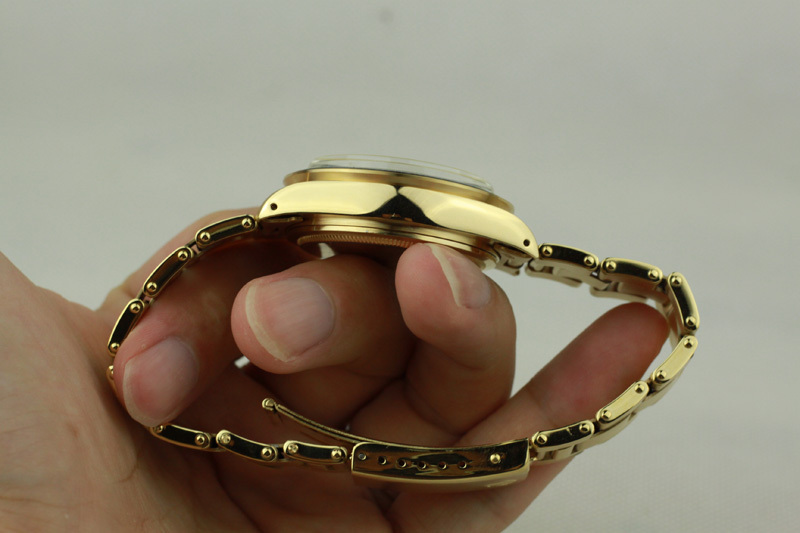 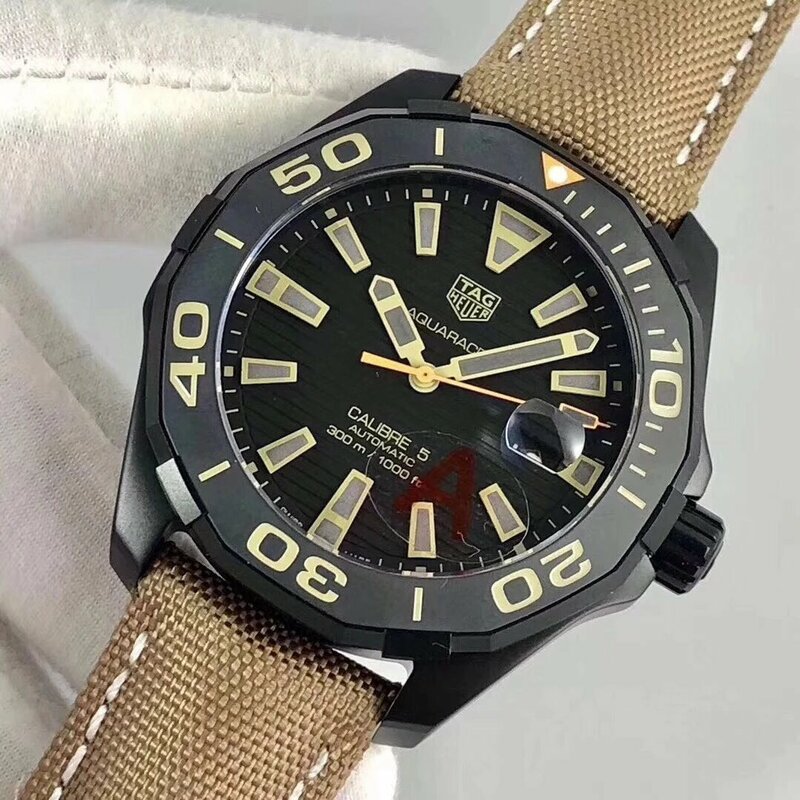 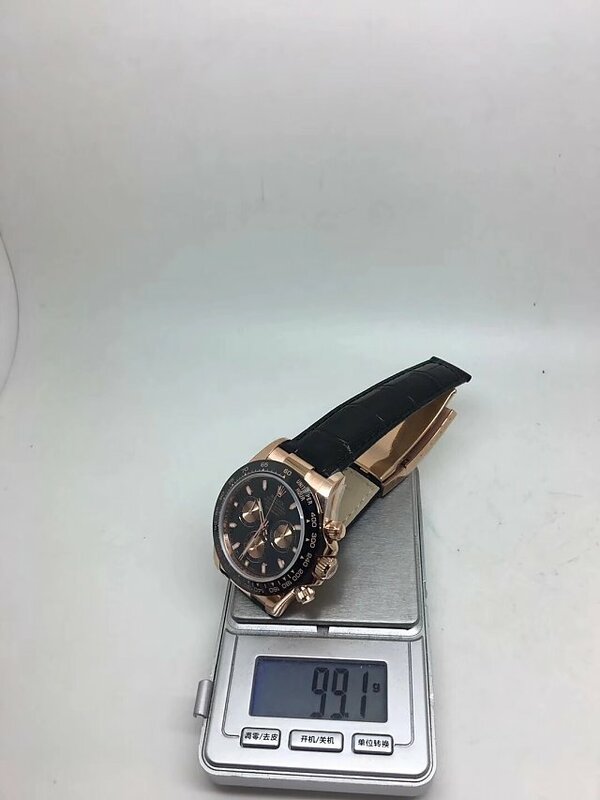 After many years of wearing, you can send the watch to us, we can do rose gold plating for you in factory. 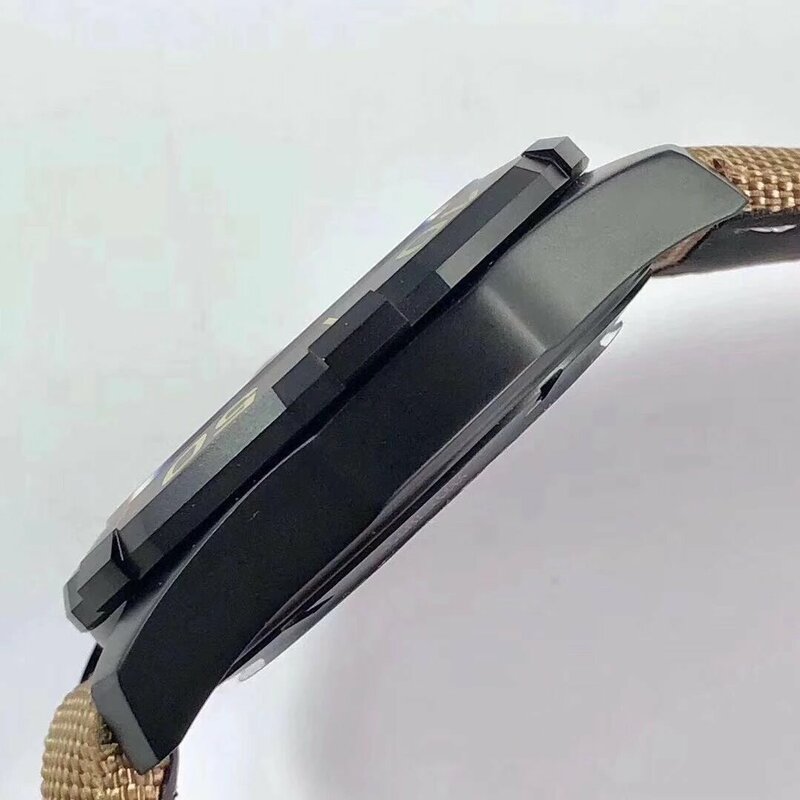 Bezel is real black ceramic with rose gold markings. 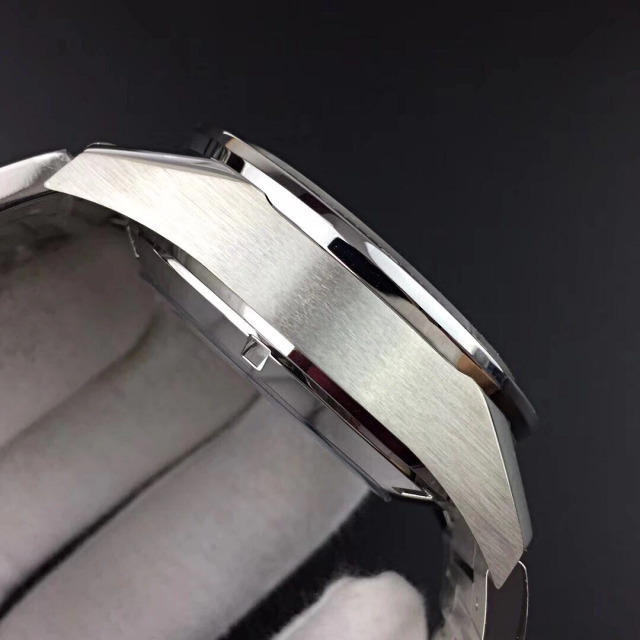 On solid case back, the center is brushed while the round edge is polished. 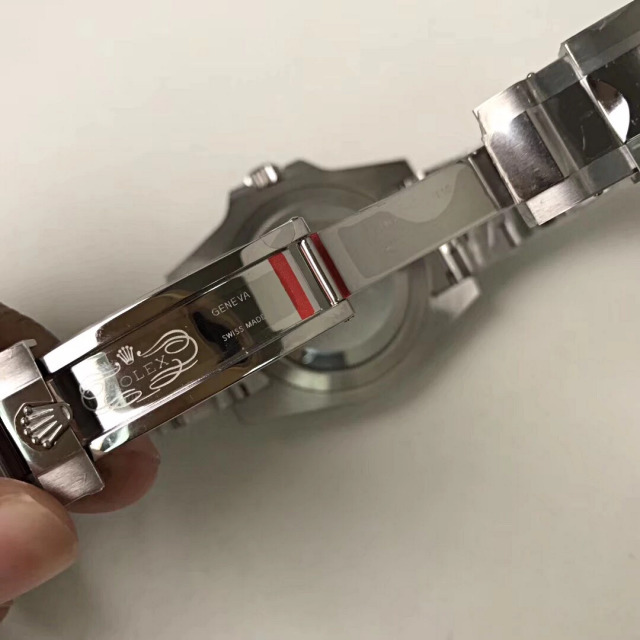 The back of each lug is engraved with some symbols, I do not know them. 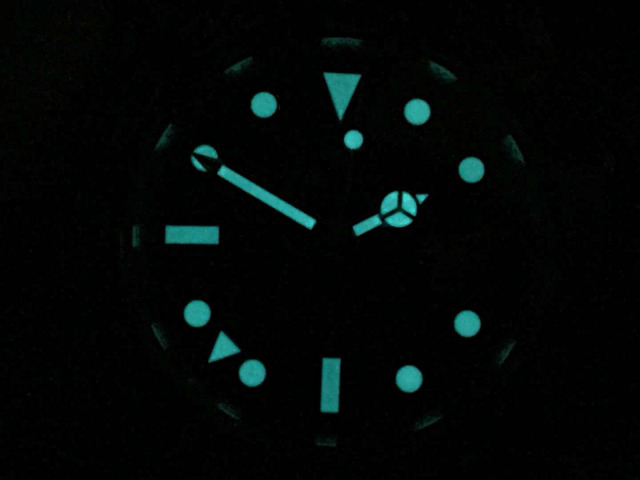 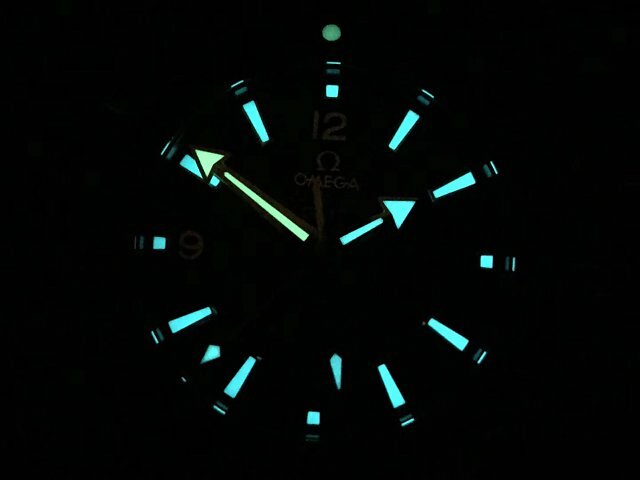 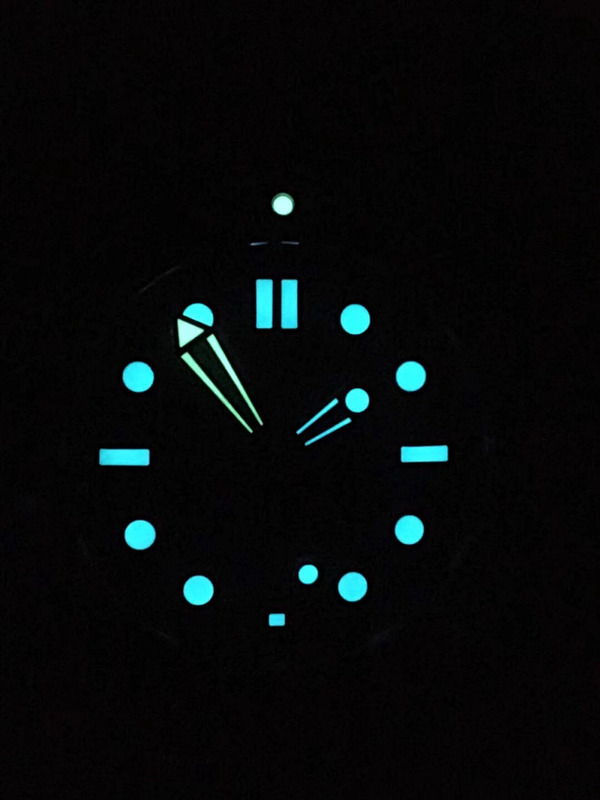 Rose gold dial has Swiss lume applied on hour markers and hands, there will be a strong blue lume effect in the dark. 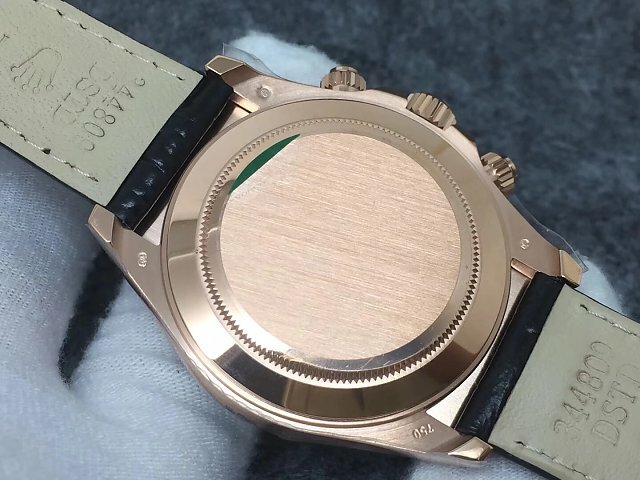 The sunray rose gold dial has a high quality texture. 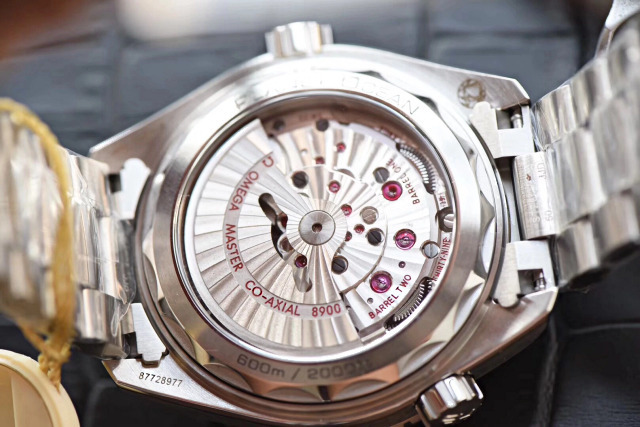 Three subdials have their correct function, small seconds subdial is positioned at 6 o’clock, the small dial at 3 o’clock is for 30-minute chronograph, while the small subdial at 9 o’clock is for 12-hour chronograph. 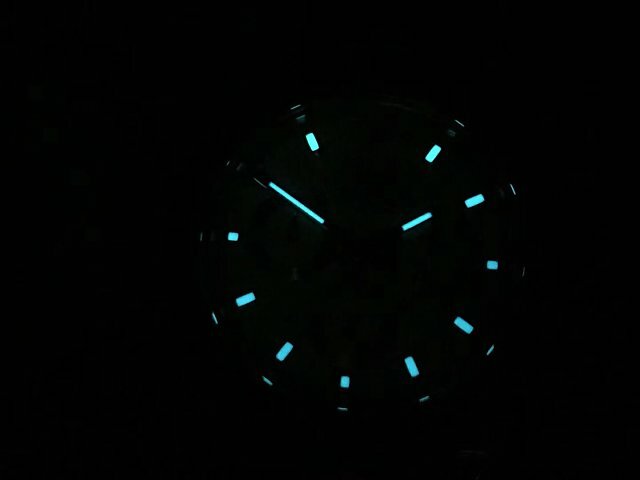 These subdials are all working right. 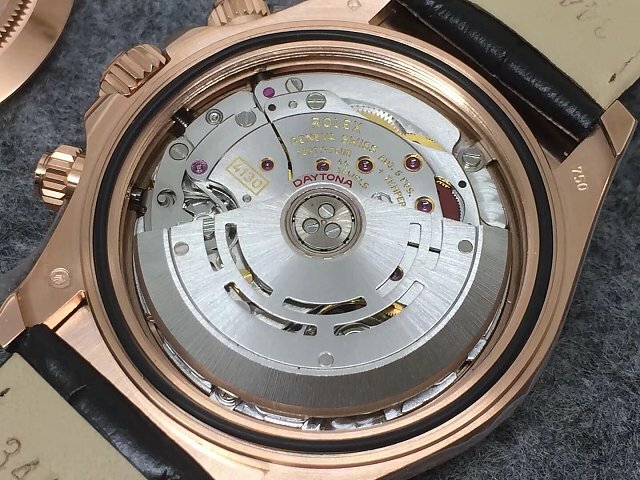 In details, they have rose gold edge with black circles on the center. 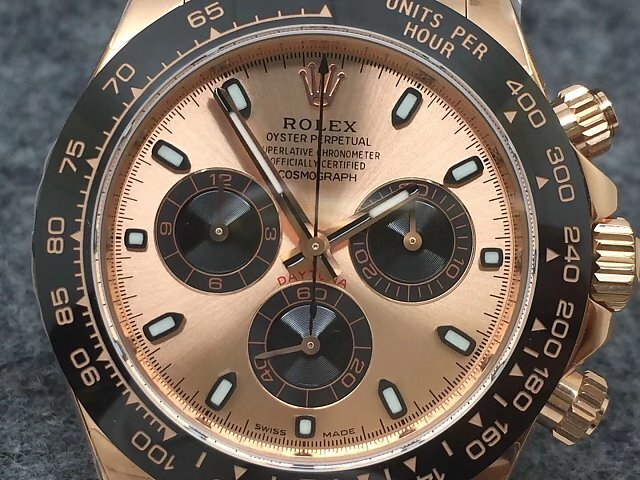 The replica Rolex Daytona watch is equipped with a black leather band, which is made of genuine alligator leather. 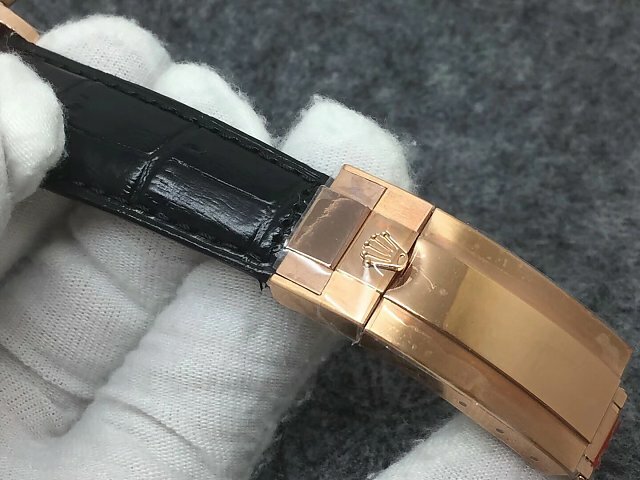 The leather strap has a rose gold buckle, there is a delicate Rolex Crown on the buckle. 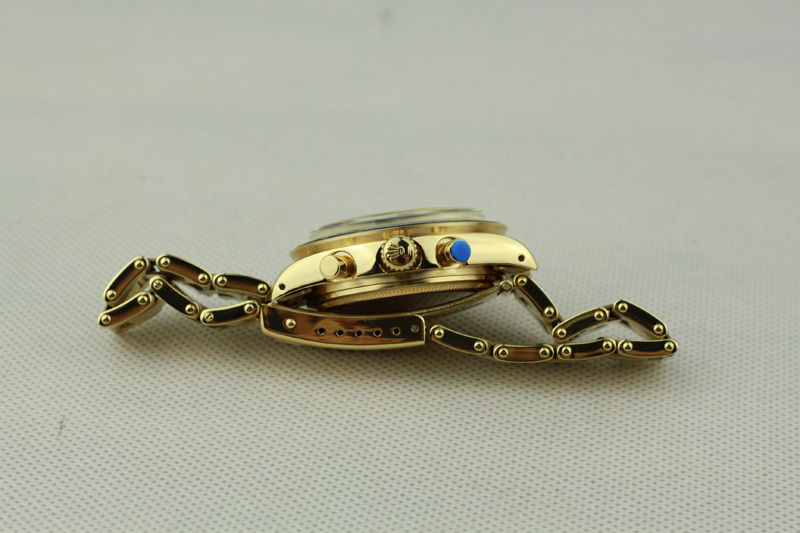 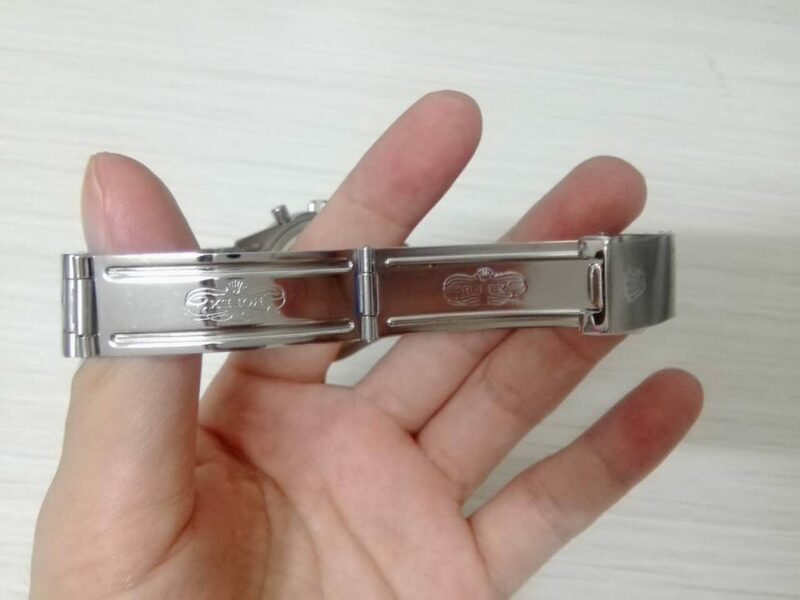 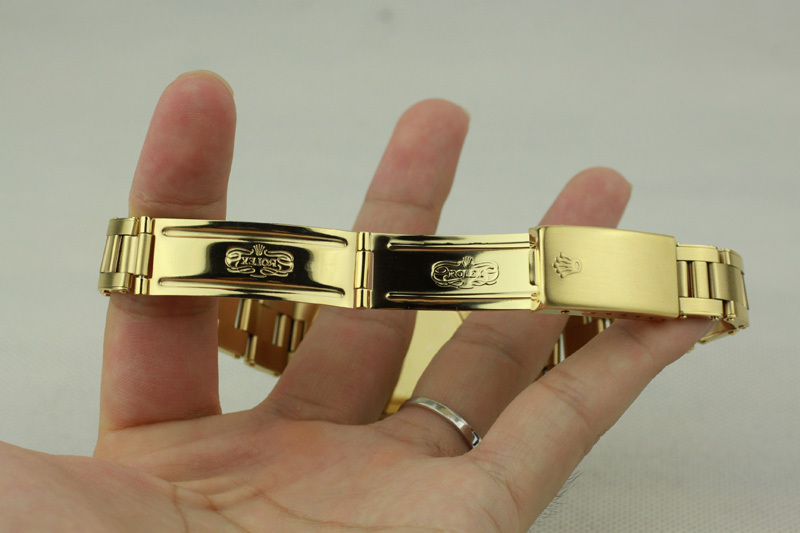 When opening the clasp, you will notice the engravings are perfectly done by the factory. 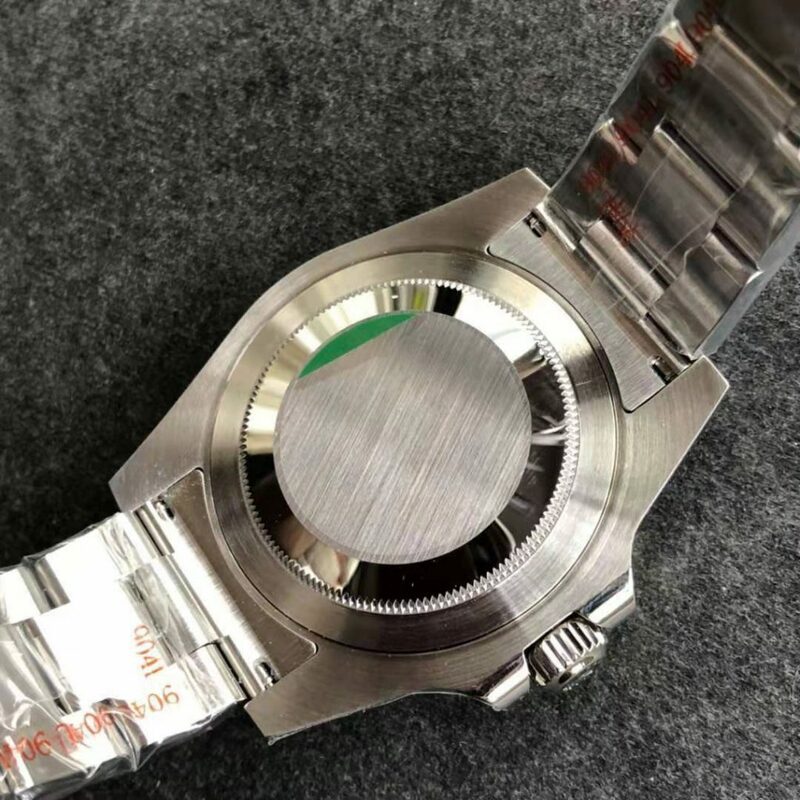 By the way, the watch has a water resistant depth of 50 meters.